2 The AP Program The Advanced Placement program was begun by the College Board in 1955 to construct standard achievement exams that would allow highly motivated high school students the opportunity to be awarded advanced placement as freshmen in colleges and universities in the U.S. Today, there are 33 course and exams offered all over the nation and the world. 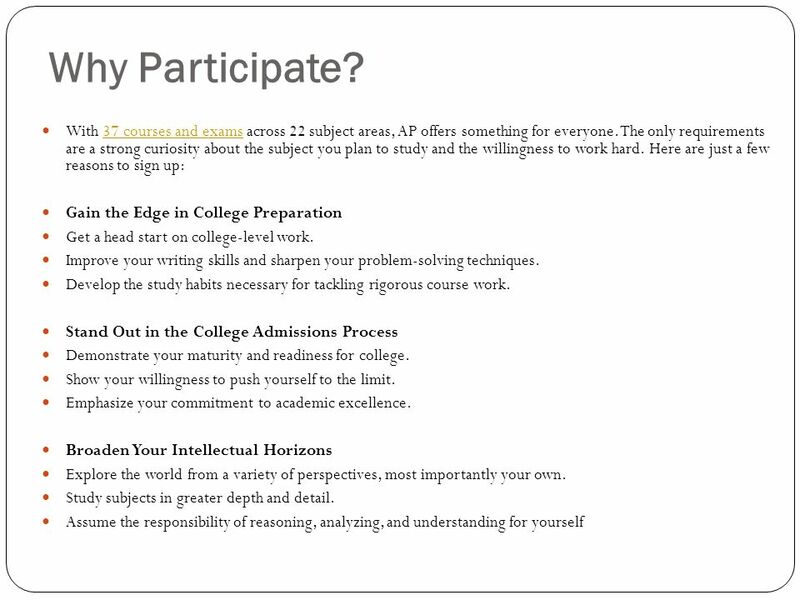 The AP programs are designed for high school students who wish to take college-level courses. 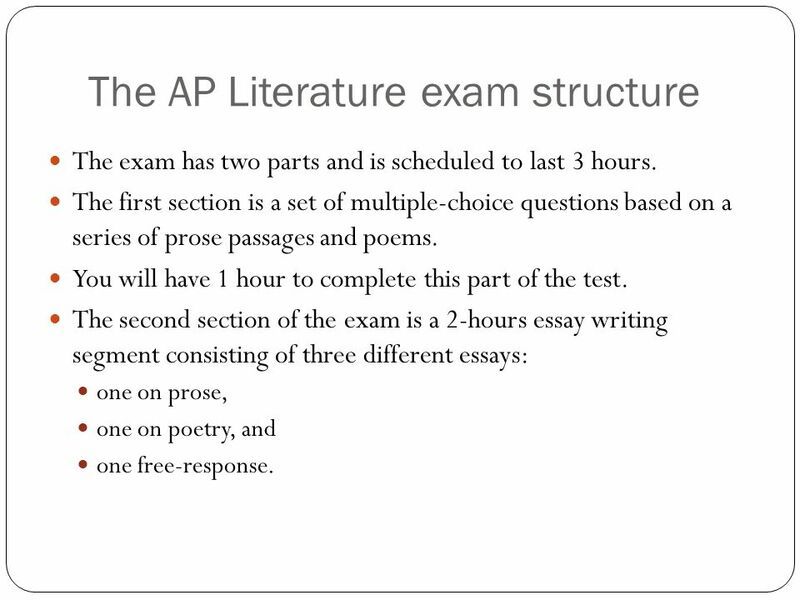 The AP Literature course and exam are designed to involve high school students in college-level English studies in both literature and composition. 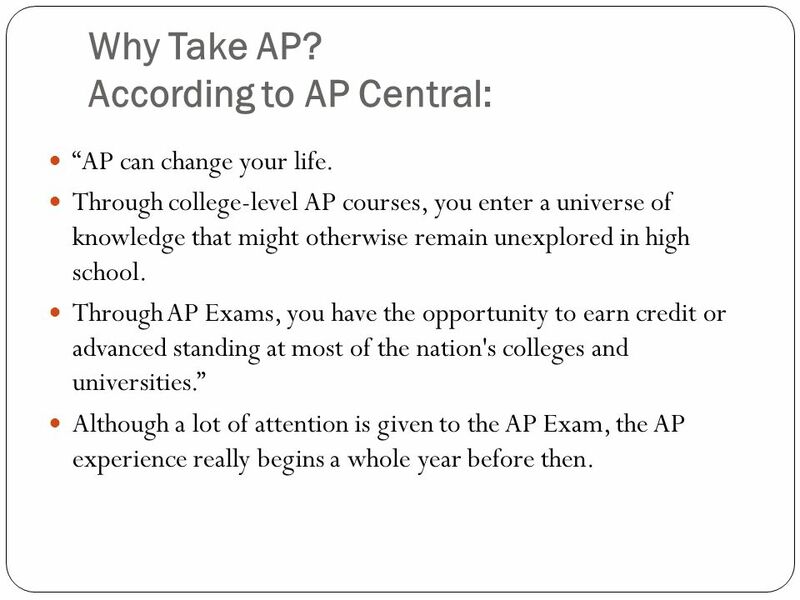 “AP can change your life. Through college-level AP courses, you enter a universe of knowledge that might otherwise remain unexplored in high school. Through AP Exams, you have the opportunity to earn credit or advanced standing at most of the nation's colleges and universities.” Although a lot of attention is given to the AP Exam, the AP experience really begins a whole year before then. 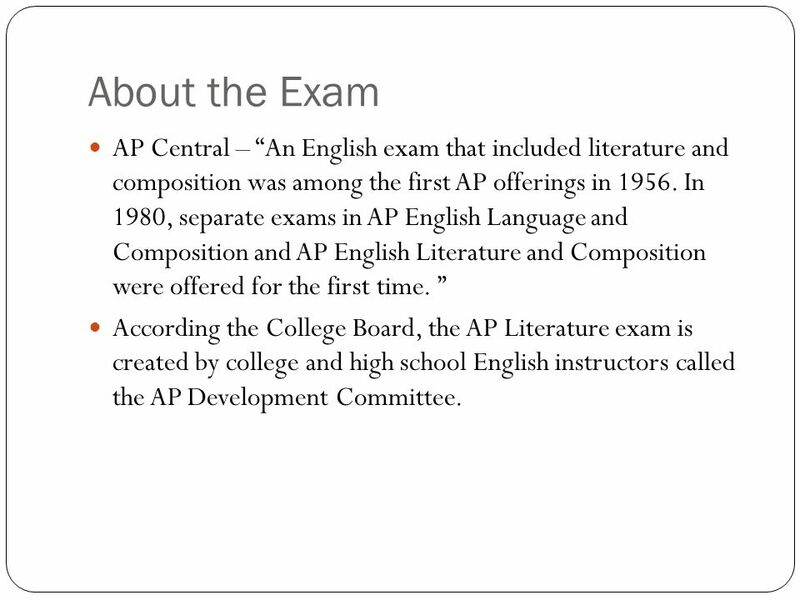 5 About the Exam AP Central – “An English exam that included literature and composition was among the first AP offerings in In 1980, separate exams in AP English Language and Composition and AP English Literature and Composition were offered for the first time. 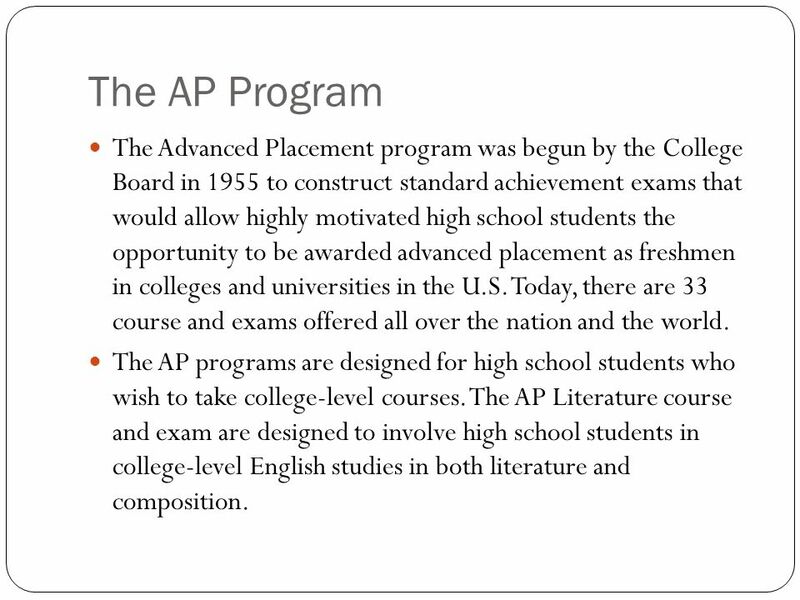 ” According the College Board, the AP Literature exam is created by college and high school English instructors called the AP Development Committee. 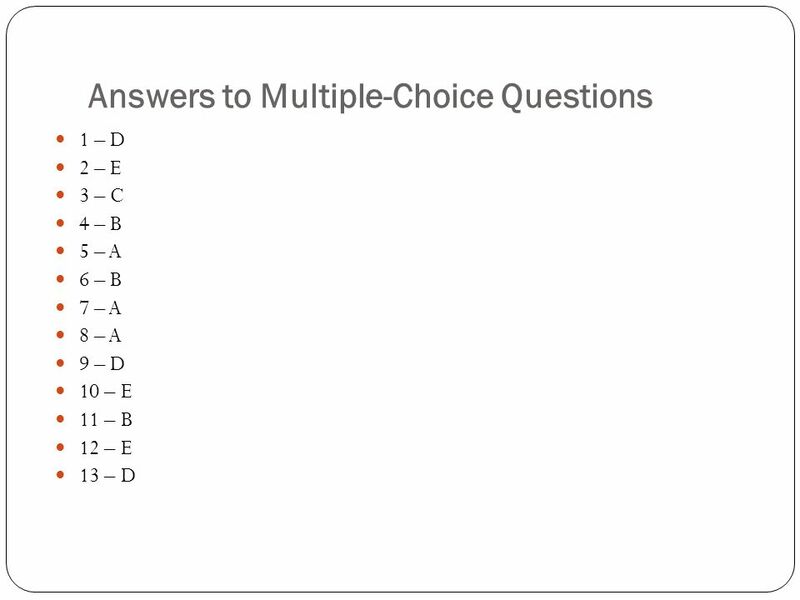 7 AP Exam Scores The Readers’ scores on the free-response questions are combined with the results of the computer-scored multiple-choice questions; the weighted raw scores are summed to give a composite score. 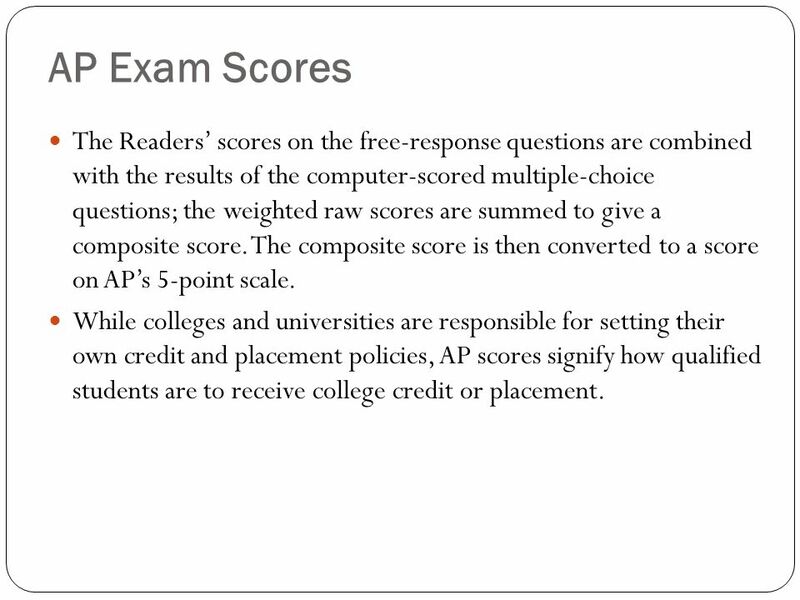 The composite score is then converted to a score on AP’s 5-point scale. While colleges and universities are responsible for setting their own credit and placement policies, AP scores signify how qualified students are to receive college credit or placement. 9 Composite score The total composite score for the AP Lit test is 150. 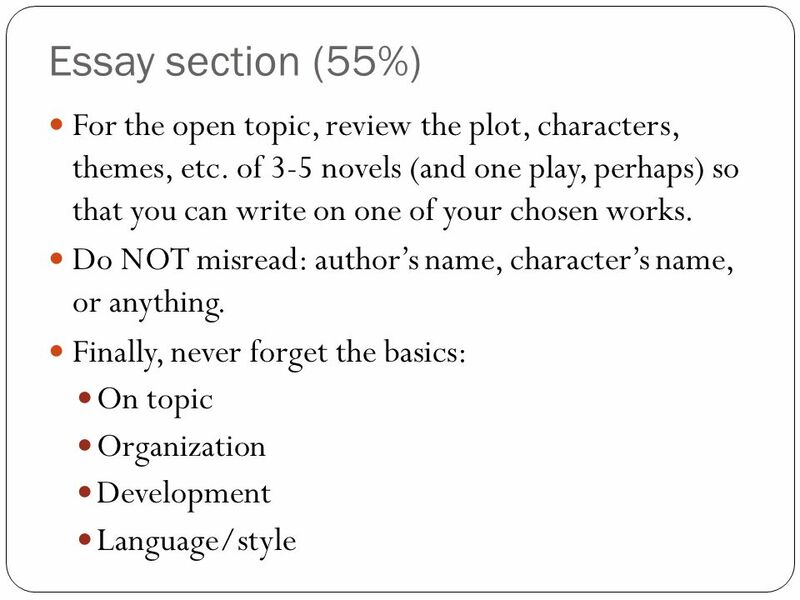 Of this score, 55% is the essay section; that equals 82.5 points. 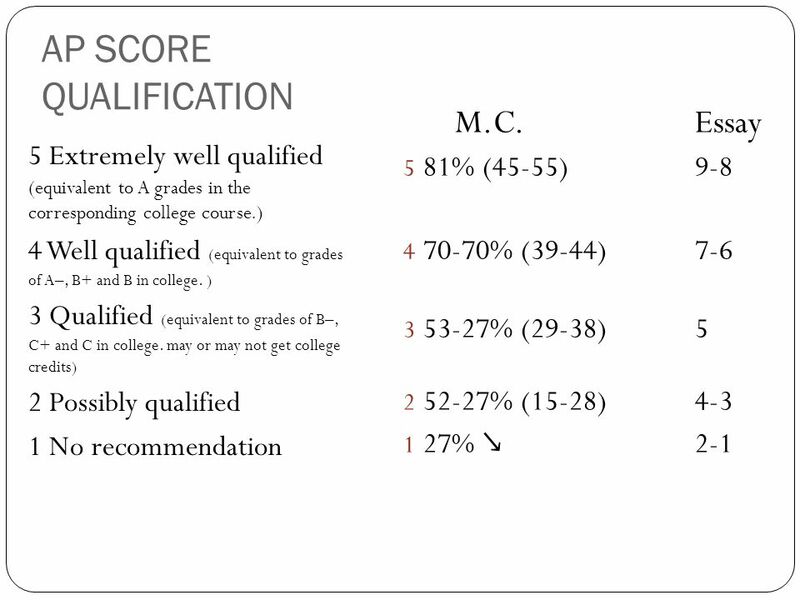 The multiple-choice section is 45% of the composite score, which equals 67.5 points. 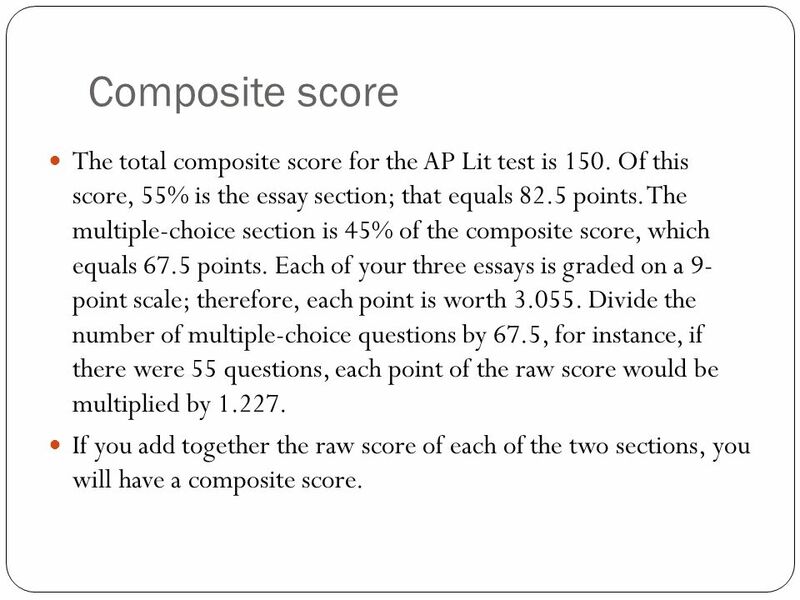 Each of your three essays is graded on a 9- point scale; therefore, each point is worth Divide the number of multiple-choice questions by 67.5, for instance, if there were 55 questions, each point of the raw score would be multiplied by If you add together the raw score of each of the two sections, you will have a composite score. 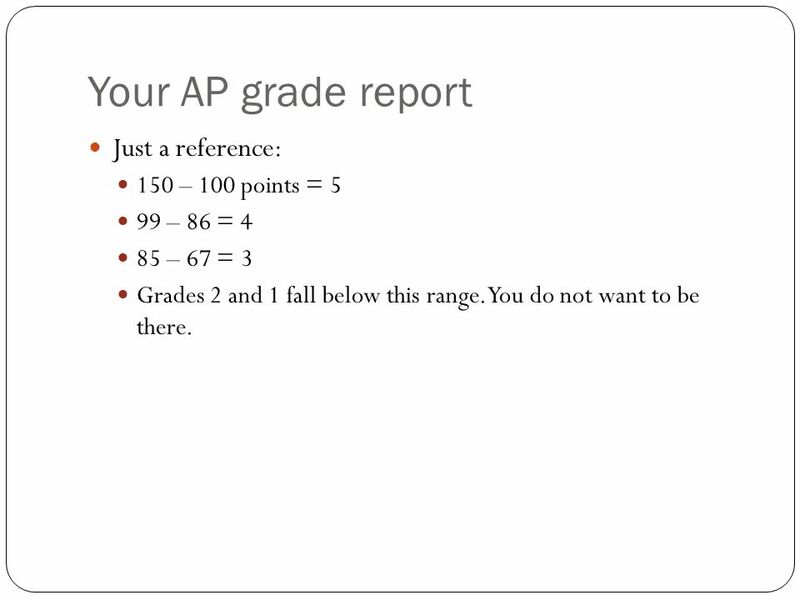 99 – 86 = 4 85 – 67 = 3 Grades 2 and 1 fall below this range. You do not want to be there. 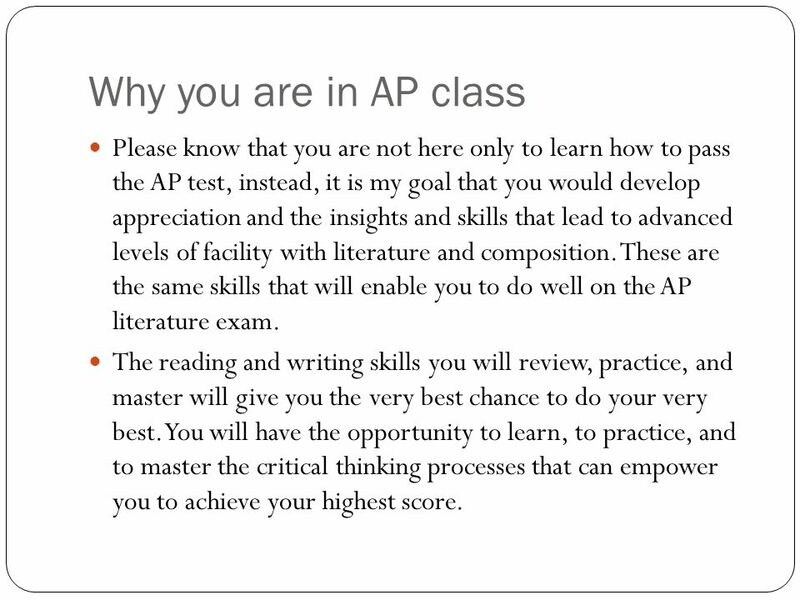 12 Why you are in AP class Please know that you are not here only to learn how to pass the AP test, instead, it is my goal that you would develop appreciation and the insights and skills that lead to advanced levels of facility with literature and composition. 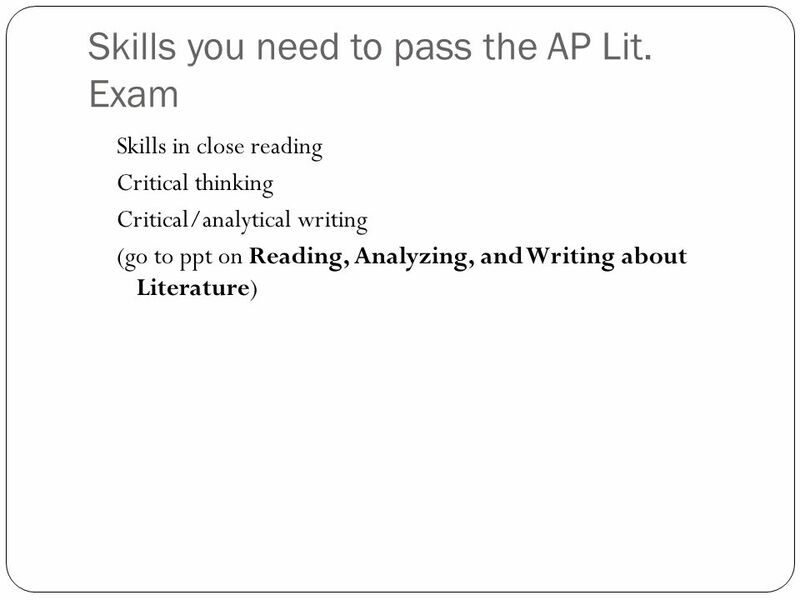 These are the same skills that will enable you to do well on the AP literature exam. The reading and writing skills you will review, practice, and master will give you the very best chance to do your very best. You will have the opportunity to learn, to practice, and to master the critical thinking processes that can empower you to achieve your highest score. 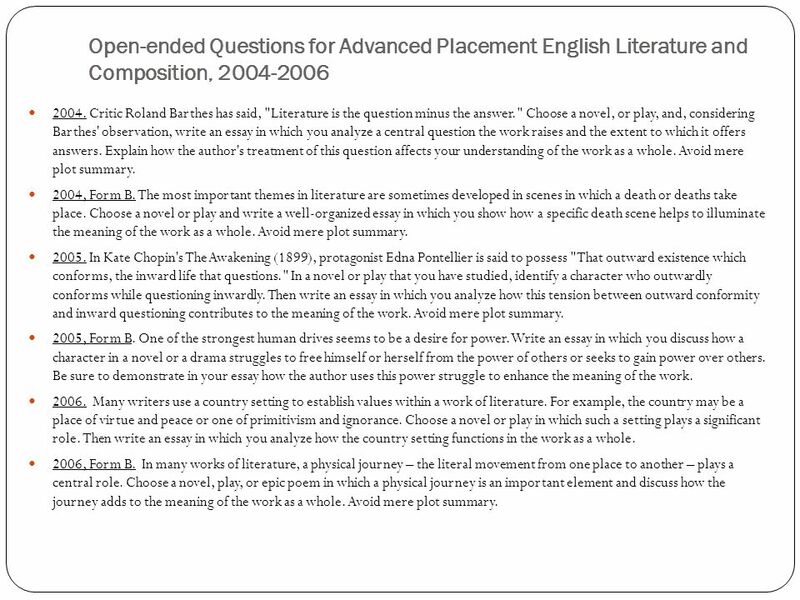 AP English Literature and Composition classes resemble college classrooms and give both students and teachers an opportunity to challenge easy answers, replace formulaic writing with original and complex arguments, and grapple with more subtle and divergent understandings of perennial human problems. 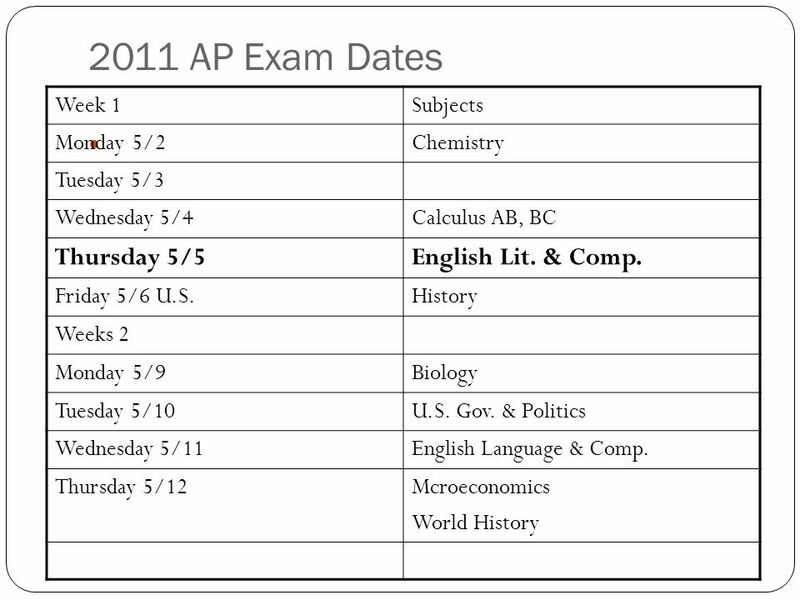 AP classes prepare students to succeed at the most important challenges they will find in college. 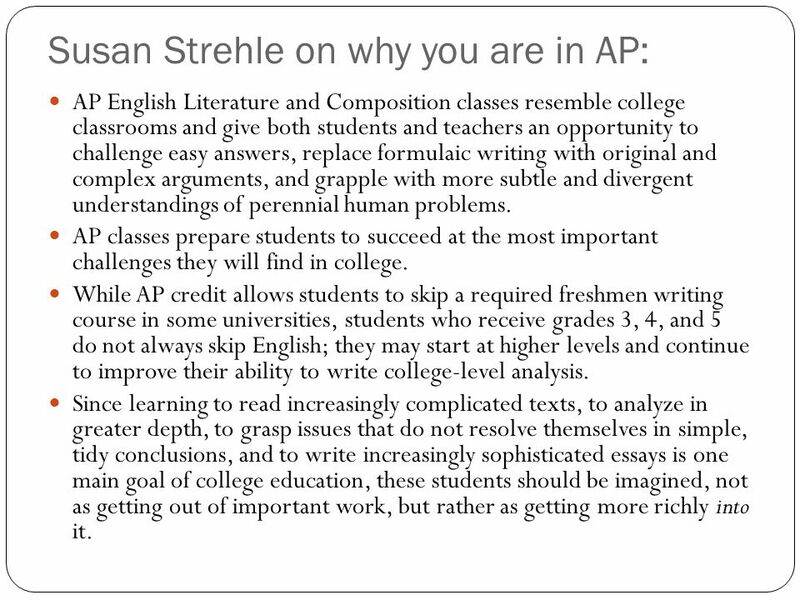 While AP credit allows students to skip a required freshmen writing course in some universities, students who receive grades 3, 4, and 5 do not always skip English; they may start at higher levels and continue to improve their ability to write college-level analysis. Since learning to read increasingly complicated texts, to analyze in greater depth, to grasp issues that do not resolve themselves in simple, tidy conclusions, and to write increasingly sophisticated essays is one main goal of college education, these students should be imagined, not as getting out of important work, but rather as getting more richly into it. 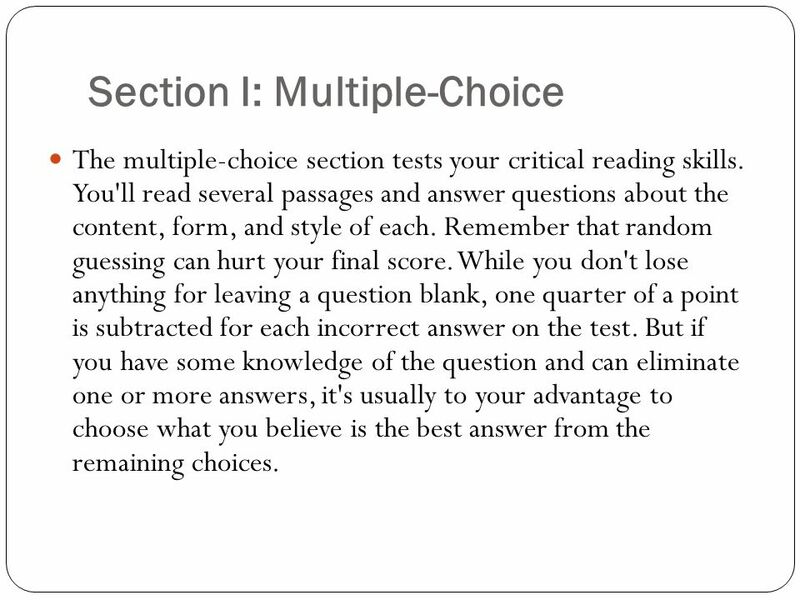 The multiple-choice section tests your critical reading skills. You'll read several passages and answer questions about the content, form, and style of each. Remember that random guessing can hurt your final score. While you don't lose anything for leaving a question blank, one quarter of a point is subtracted for each incorrect answer on the test. But if you have some knowledge of the question and can eliminate one or more answers, it's usually to your advantage to choose what you believe is the best answer from the remaining choices. 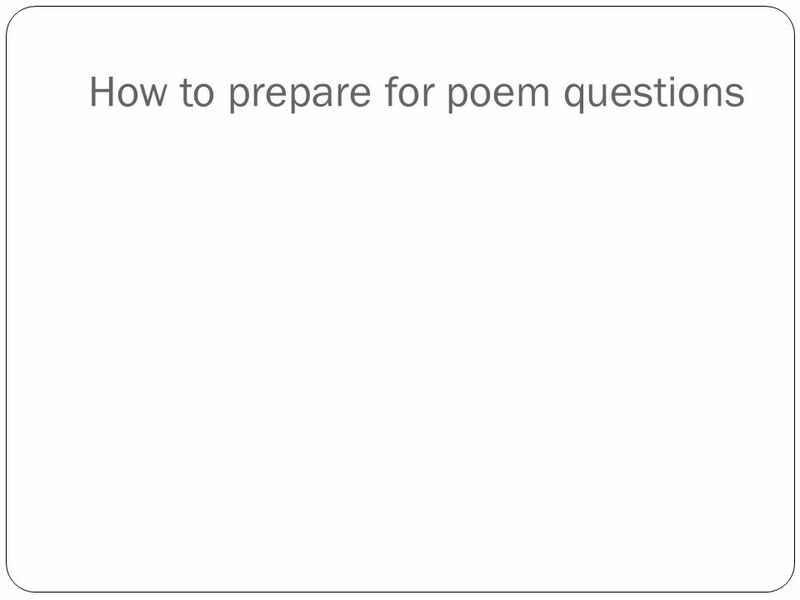 The first section is a set of multiple-choice questions based on a series of prose passages and poems. 1 hour; usually 55 questions (about one minute per question, including reading time) Receive 1 point for each correct response As of 2011, you will not lose any fraction of a point for a wrong answer; so always guess something. Do NOT leave any question blank! Divide time per passage – be ruthless! About minutes per passage. Expect at least two poems, two prose passages (occasionally an extra piece of drama). Out of the four passages, 2 are British and 2 American. 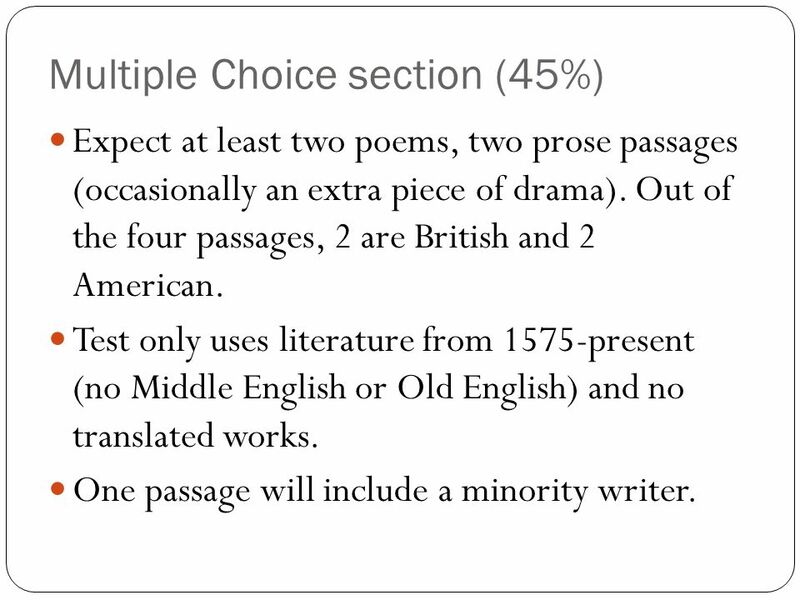 Test only uses literature from 1575-present (no Middle English or Old English) and no translated works. One passage will include a minority writer. Work systematically; do NOT skip around from passage to passage. Answer all the questions for a passage before continuing. Skim the questions before reading the passage (works for most). DON’T read the answers yet! 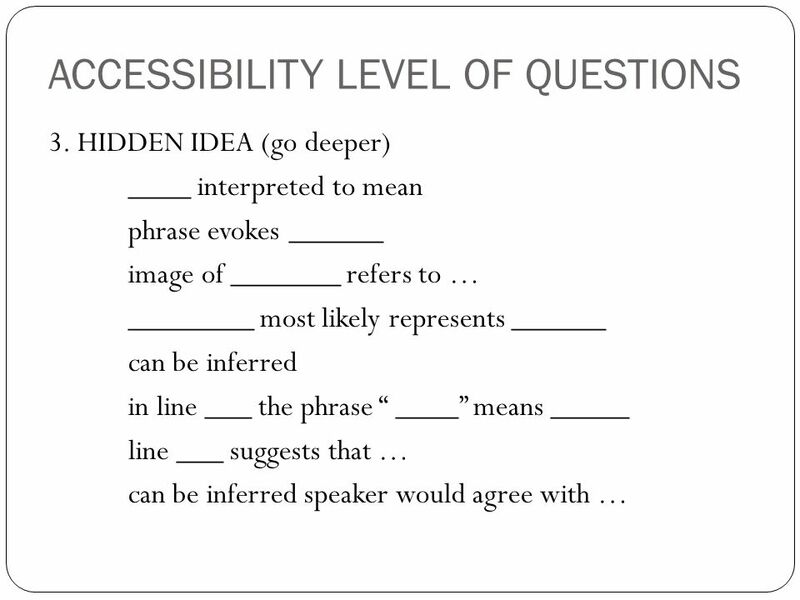 Look 3-4 specific ideas to search for, ignoring the “generic” questions. Turn it into a scavenger hunt. Read the passage ONCE. Avoid rereading at this time; get the content by reading a. Actively b. Visualize (2 meanings) c. PARAPHRASE as you read(each paragraph and whole passage)! Write on the test! Underline key words. d. Analyze for theme, style, speaker, structure, tone, figurative language Read the questions CAREFULLY! Many wrong answers stem from misreading the question; know what is being asked. Accuracy and efficiency count. Read ALL answer choices, eliminate wrong ones as you go. Remember directions call for the BEST answer choice. Essential to practice at home or small groups. 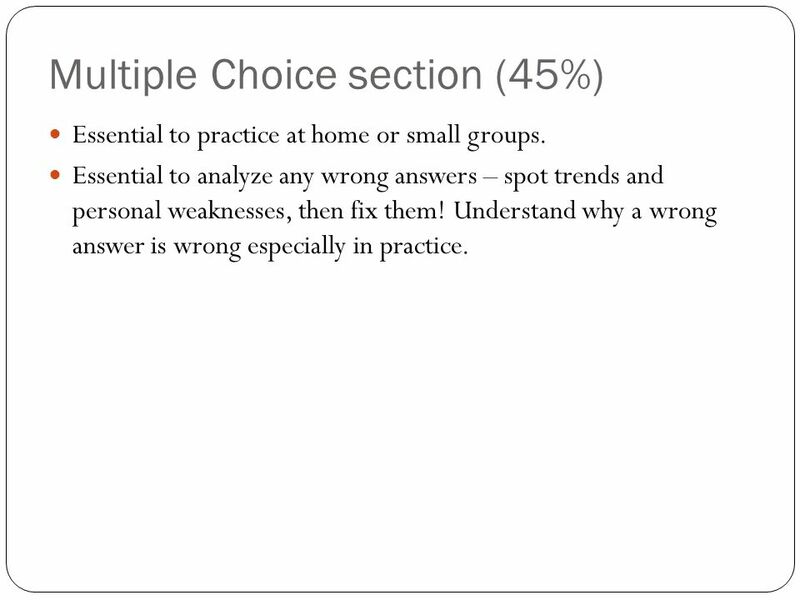 Essential to analyze any wrong answers – spot trends and personal weaknesses, then fix them! 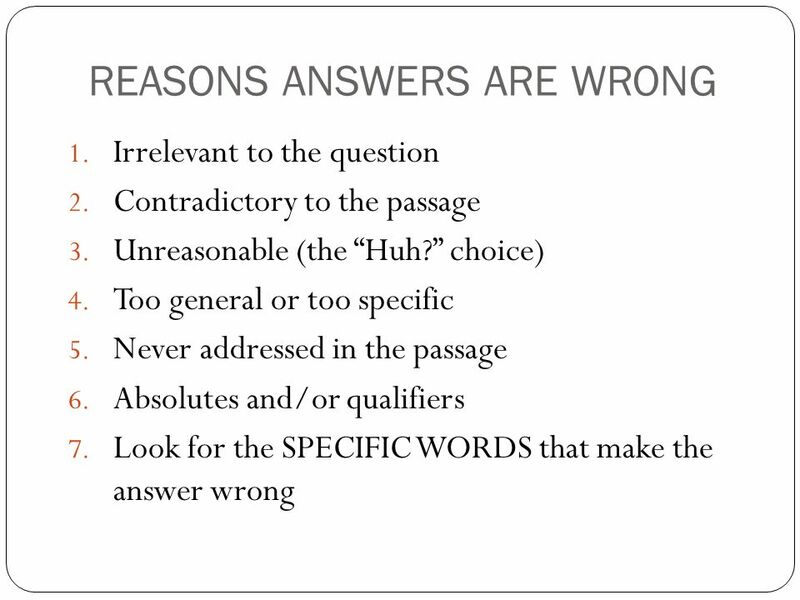 Understand why a wrong answer is wrong especially in practice. Questions Read the following passage carefully before you choose your answers. Please go to your test sheet. 29 Mr. Jones, of whose personal accomplishments we have hitherto said very little, was, in reality, one of the handsomest young fellows in the world. His face, besides being the picture of health, had in it the most apparent marks of sweetness and good-nature. 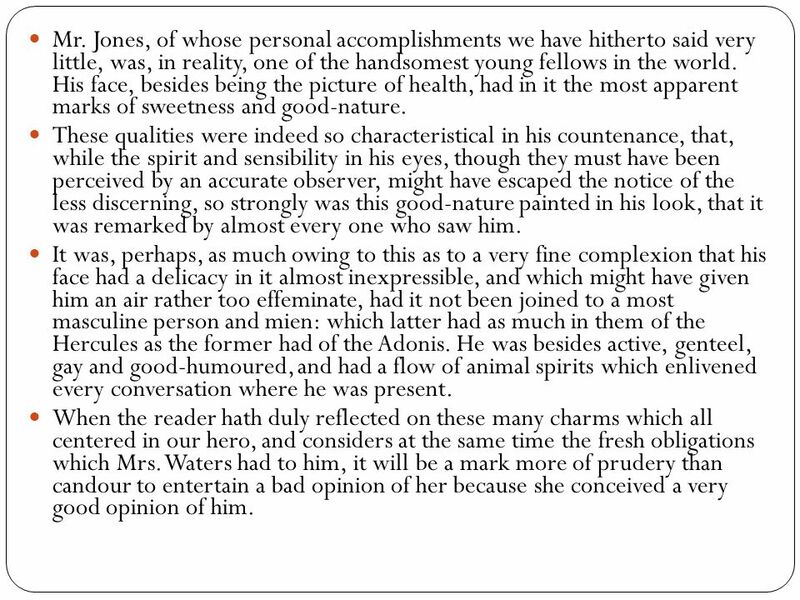 These qualities were indeed so characteristical in his countenance, that, while the spirit and sensibility in his eyes, though they must have been perceived by an accurate observer, might have escaped the notice of the less discerning, so strongly was this good-nature painted in his look, that it was remarked by almost every one who saw him. It was, perhaps, as much owing to this as to a very fine complexion that his face had a delicacy in it almost inexpressible, and which might have given him an air rather too effeminate, had it not been joined to a most masculine person and mien: which latter had as much in them of the Hercules as the former had of the Adonis. He was besides active, genteel, gay and good-humoured, and had a flow of animal spirits which enlivened every conversation where he was present. When the reader hath duly reflected on these many charms which all centered in our hero, and considers at the same time the fresh obligations which Mrs. Waters had to him, it will be a mark more of prudery than candour to entertain a bad opinion of her because she conceived a very good opinion of him. 31 The contrary happens in that love which operates between persons of the same species, but of different sexes. 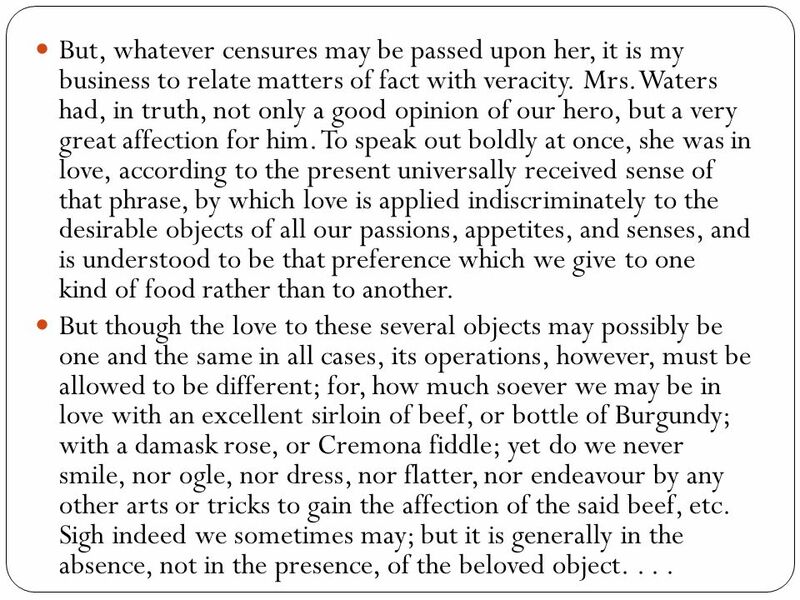 Here we are no sooner in love than it becomes our principal care to engage the affection of the object beloved. For what other purpose, indeed, are our youth instructed in all of the arts of rendering themselves agreeable? If it was not with a view to this love, I question whether any of those trades which deal in setting off and adorning the human person would procure a livelihood. Nay, those great polishers of our manners, who are by some thought to teach what principally distinguishes us from the brute creation, even dancing-masters themselves, might possibly find no place in society. 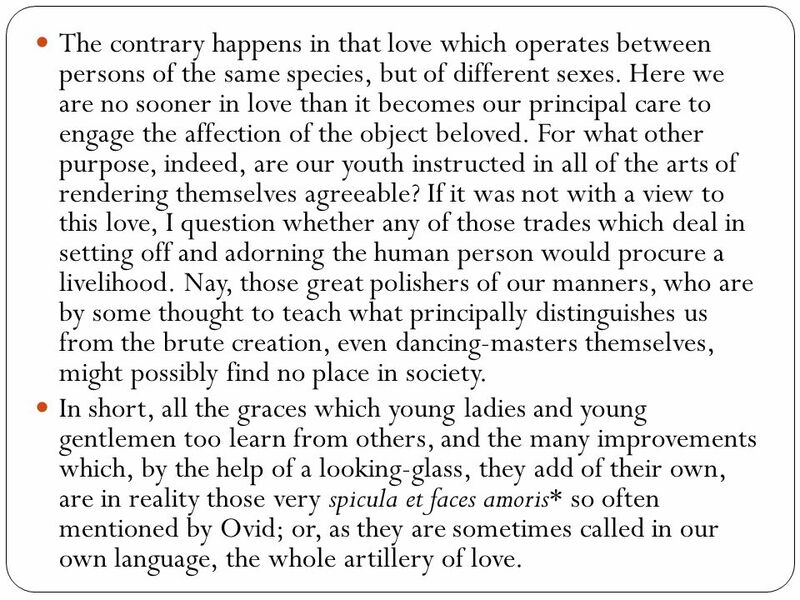 In short, all the graces which young ladies and young gentlemen too learn from others, and the many improvements which, by the help of a looking-glass, they add of their own, are in reality those very spicula et faces amoris* so often mentioned by Ovid; or, as they are sometimes called in our own language, the whole artillery of love. 32 1. 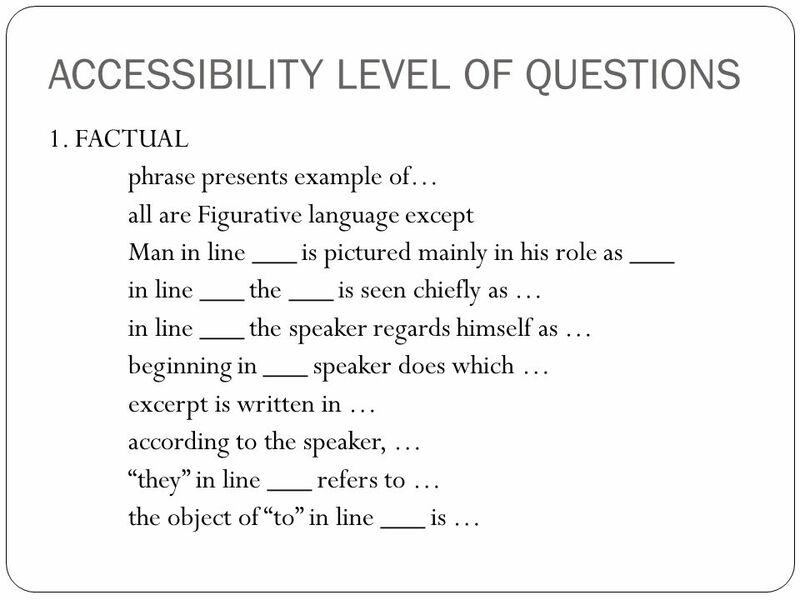 The structure of the sentence beginning in line 5 does which of the following? 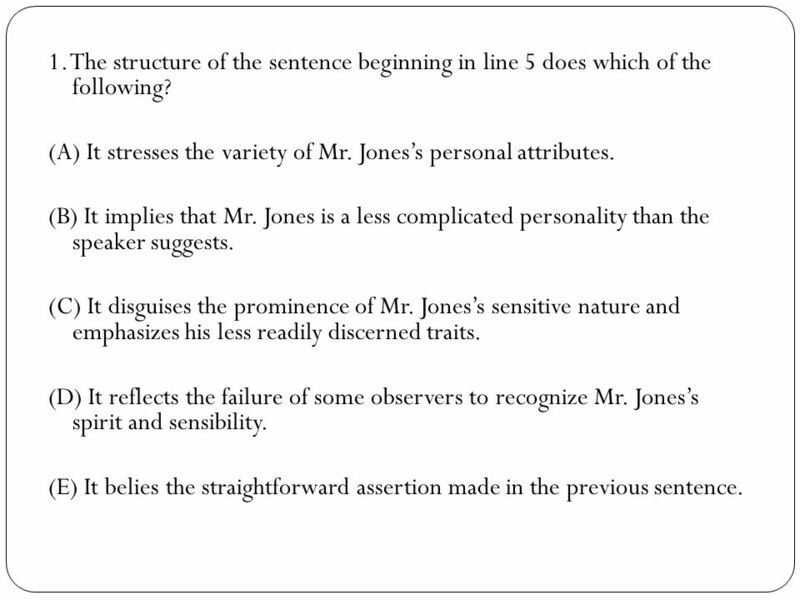 (A) It stresses the variety of Mr. Jones’s personal attributes. 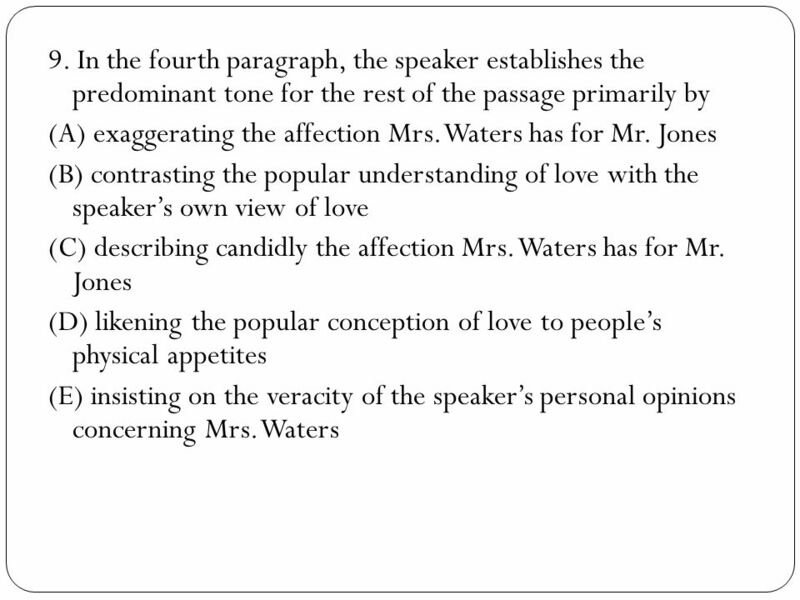 (B) It implies that Mr. Jones is a less complicated personality than the speaker suggests. 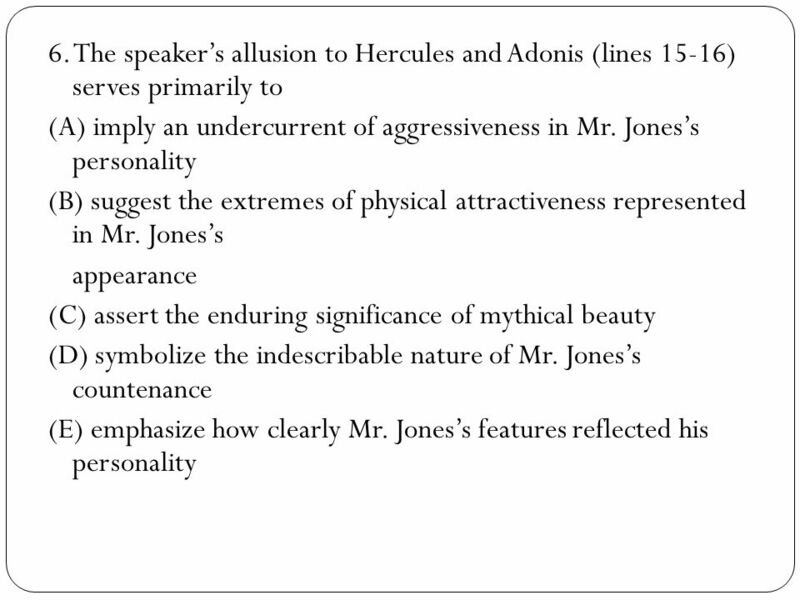 (C) It disguises the prominence of Mr. Jones’s sensitive nature and emphasizes his less readily discerned traits. 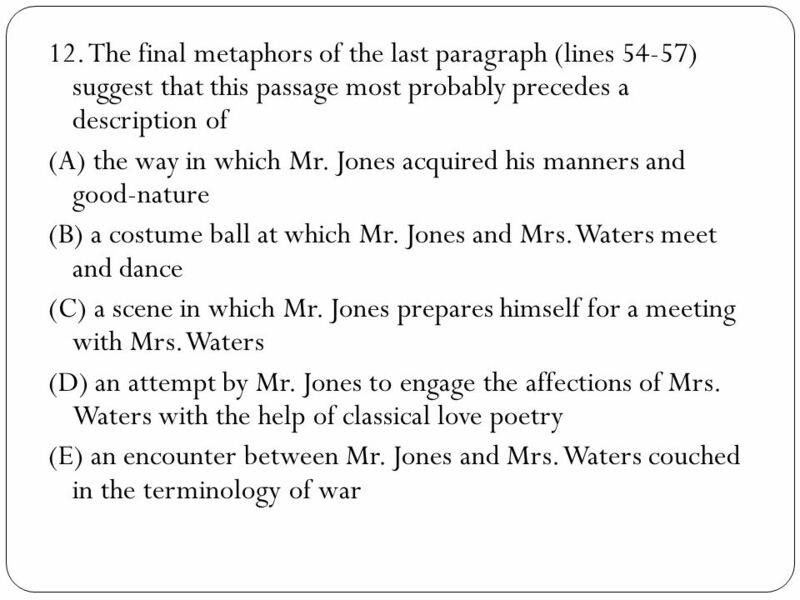 (D) It reflects the failure of some observers to recognize Mr. Jones’s spirit and sensibility. (E) It belies the straightforward assertion made in the previous sentence. 40 11. 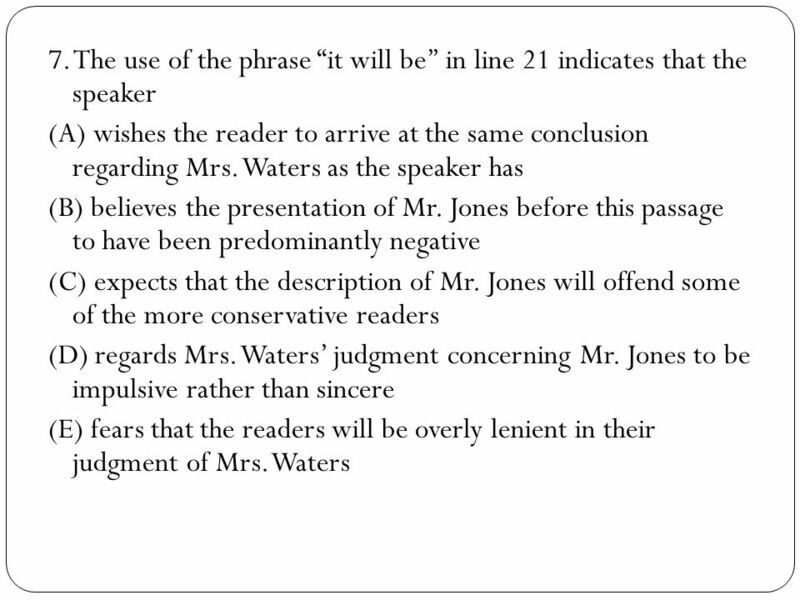 The passage indicates that the speaker believes which of the following to be true of Mr. Jones? (A) He is principally concerned with attracting the attention of women. 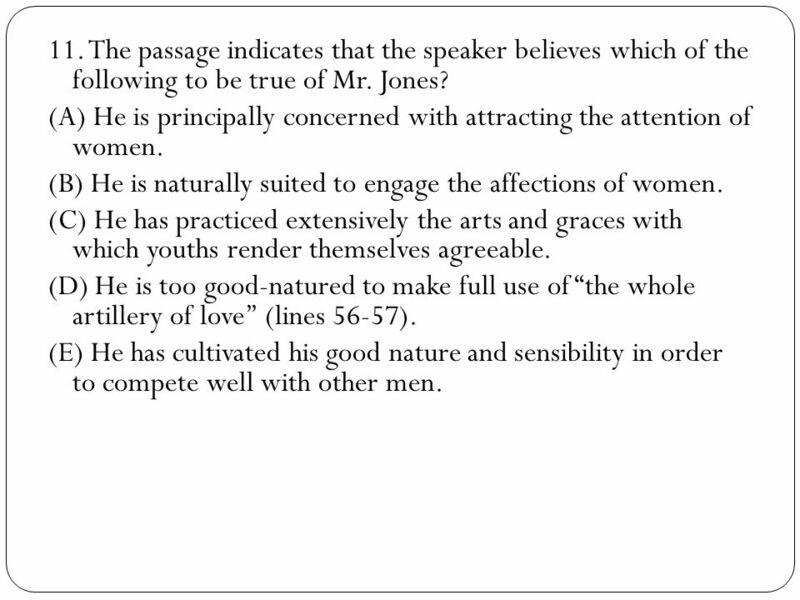 (B) He is naturally suited to engage the affections of women. (C) He has practiced extensively the arts and graces with which youths render themselves agreeable. (D) He is too good-natured to make full use of “the whole artillery of love’’ (lines 56-57). (E) He has cultivated his good nature and sensibility in order to compete well with other men. 42 13. 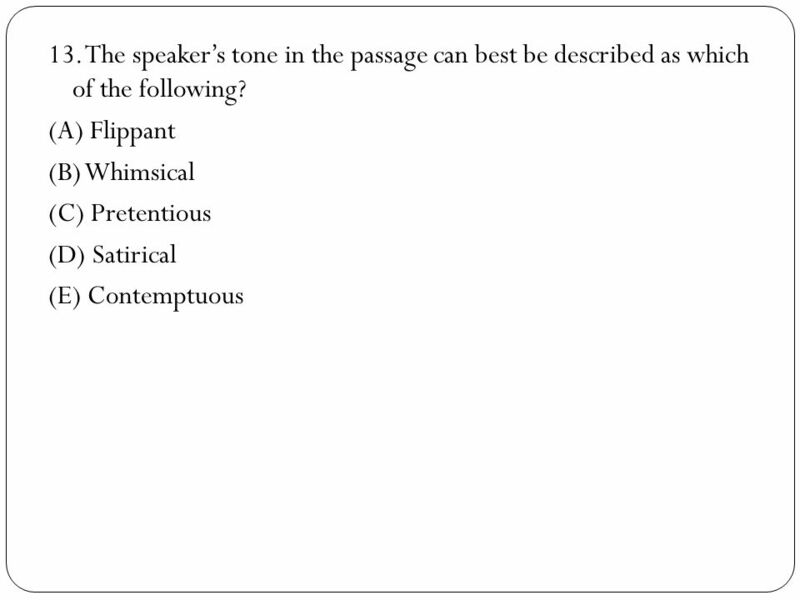 The speaker’s tone in the passage can best be described as which of the following? 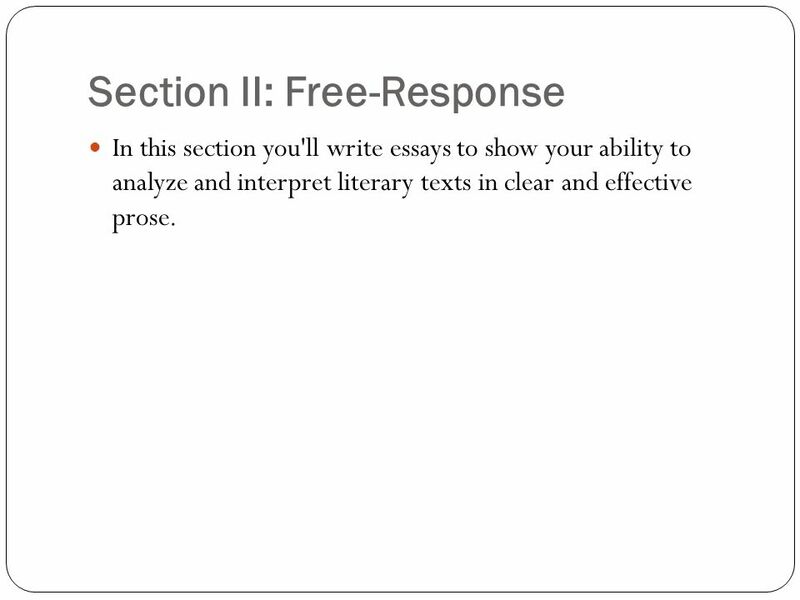 In this section you'll write essays to show your ability to analyze and interpret literary texts in clear and effective prose. 45 Essay section (55%) 2 hours; 3 essays; allow approximately 40 minutes for each. Address ALL PARTS of the prompt in every paragraph! 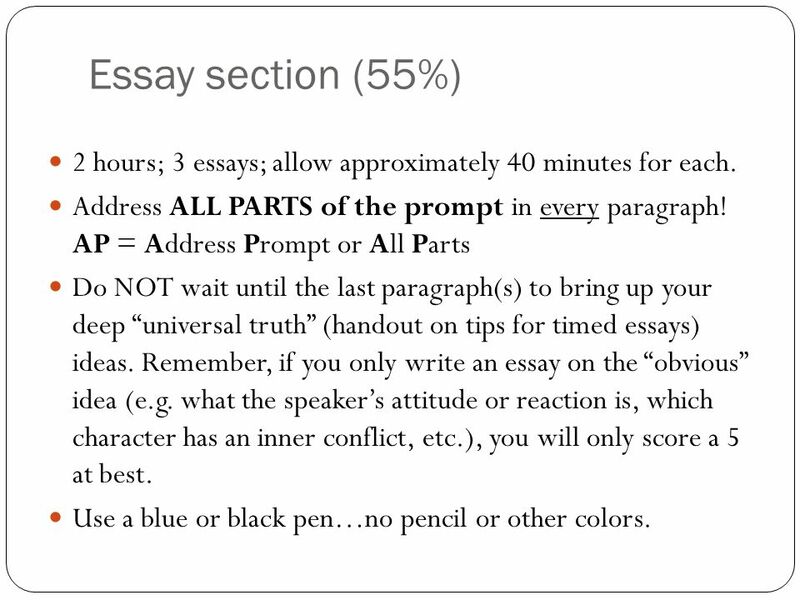 AP = Address Prompt or All Parts Do NOT wait until the last paragraph(s) to bring up your deep “universal truth” (handout on tips for timed essays) ideas. Remember, if you only write an essay on the “obvious” idea (e.g. 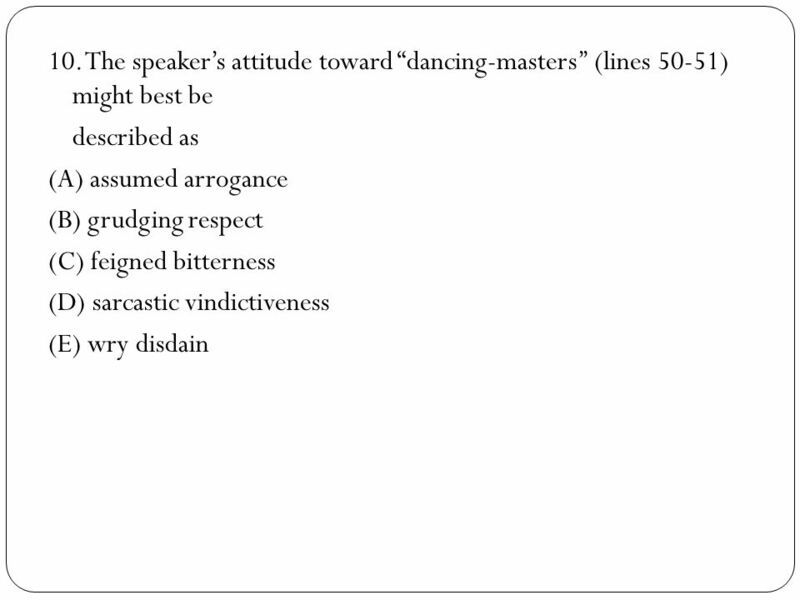 what the speaker’s attitude or reaction is, which character has an inner conflict, etc. 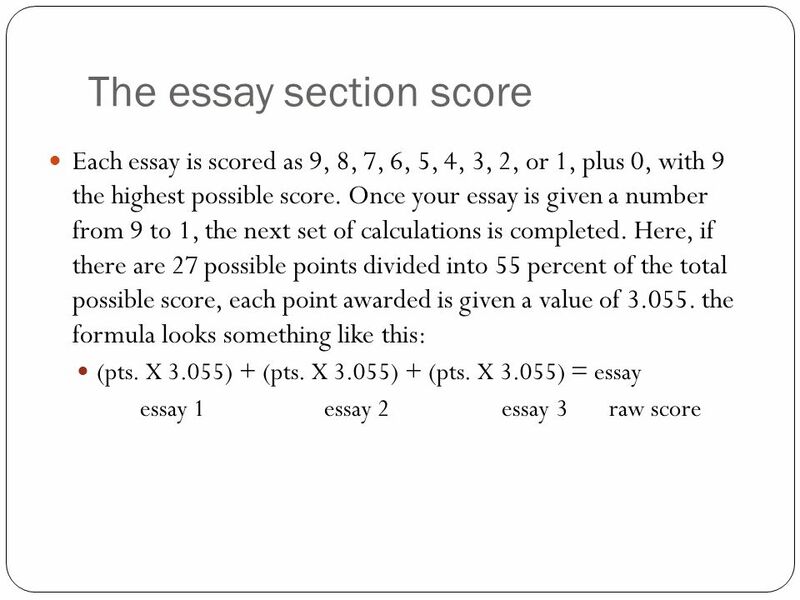 ), you will only score a 5 at best. Use a blue or black pen…no pencil or other colors. 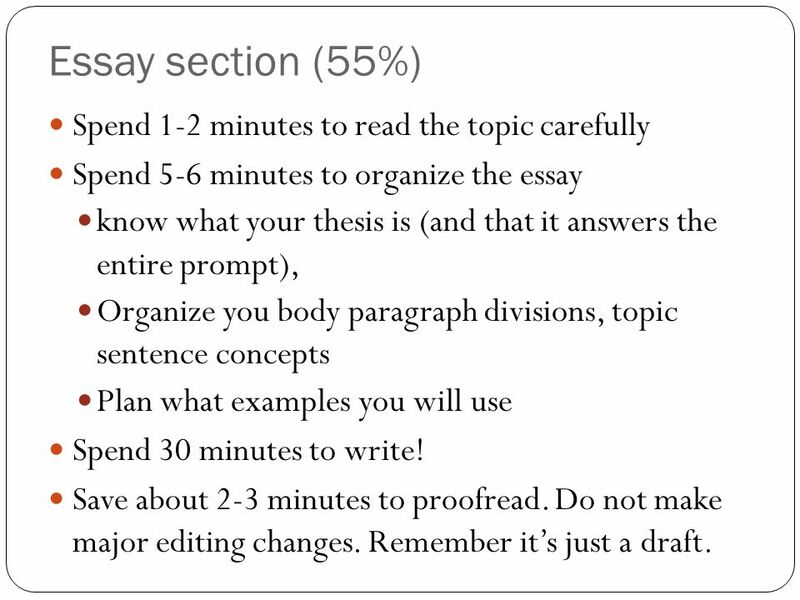 Spend 5-6 minutes to organize the essay know what your thesis is (and that it answers the entire prompt), Organize you body paragraph divisions, topic sentence concepts Plan what examples you will use Spend 30 minutes to write! Save about 2-3 minutes to proofread. Do not make major editing changes. Remember it’s just a draft. The exam has two parts and is scheduled to last 3 hours. 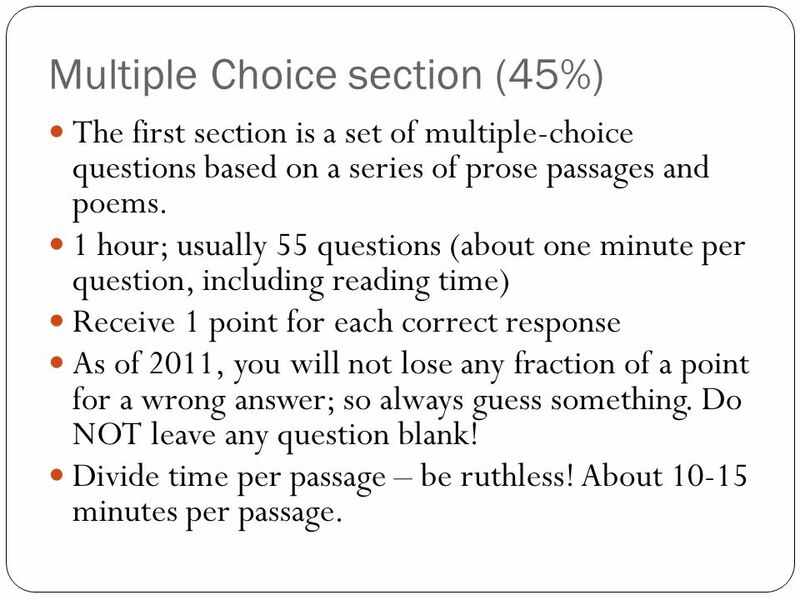 The first section is a set of multiple-choice questions based on a series of prose passages and poems. You will have 1 hour to complete this part of the test. 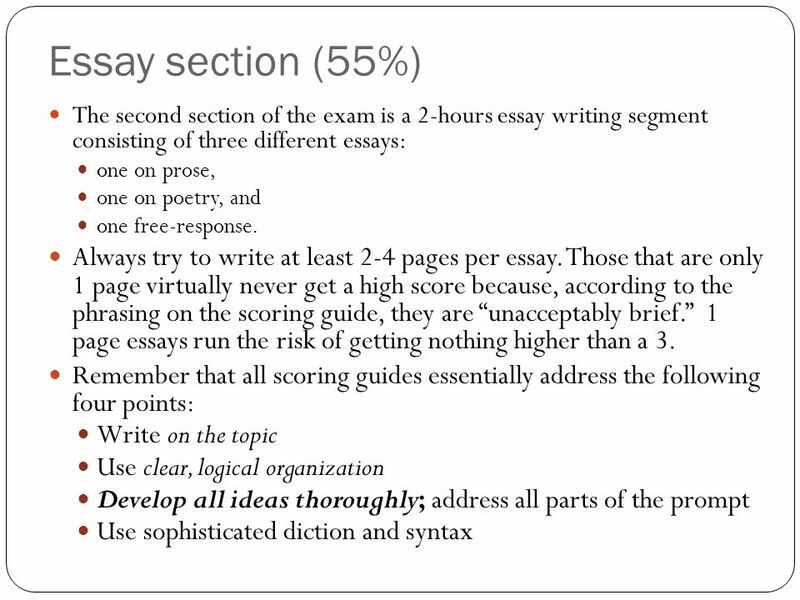 The second section of the exam is a 2-hours essay writing segment consisting of three different essays: one on prose, one on poetry, and one free-response. 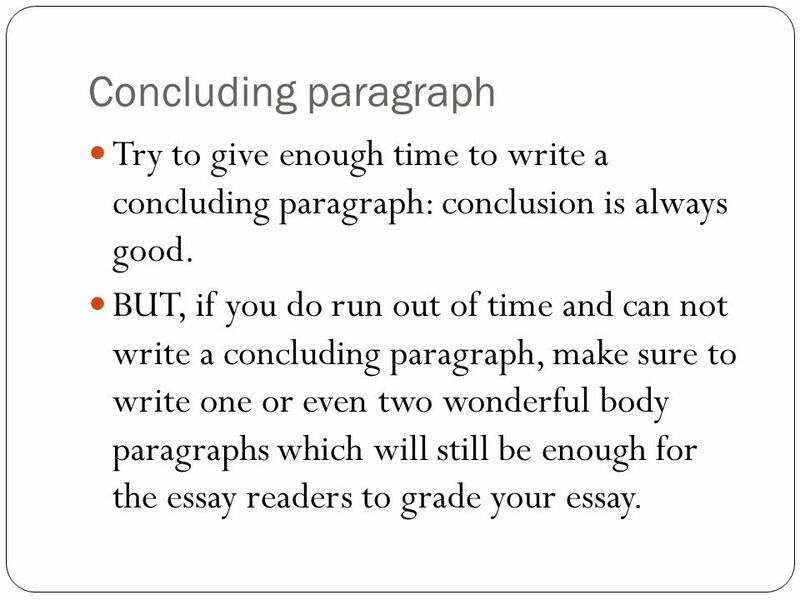 50 Concluding paragraph Try to give enough time to write a concluding paragraph: conclusion is always good. 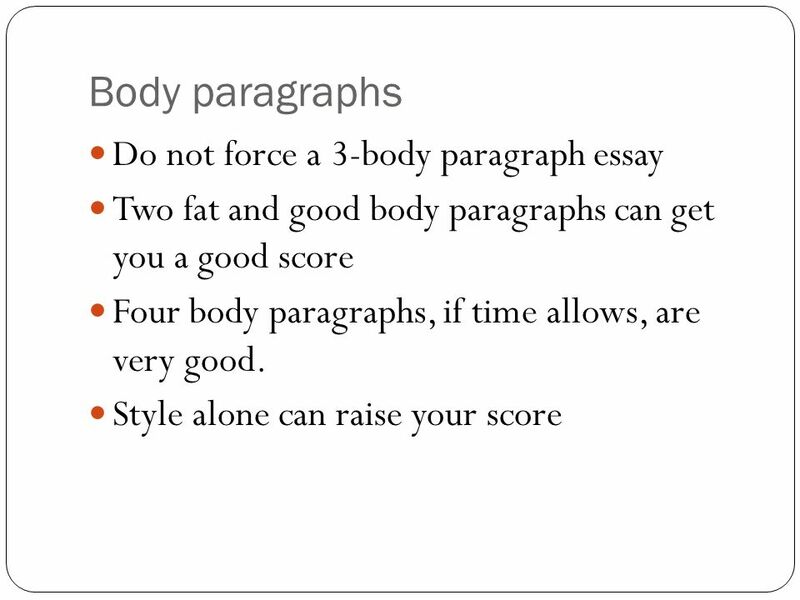 BUT, if you do run out of time and can not write a concluding paragraph, make sure to write one or even two wonderful body paragraphs which will still be enough for the essay readers to grade your essay. 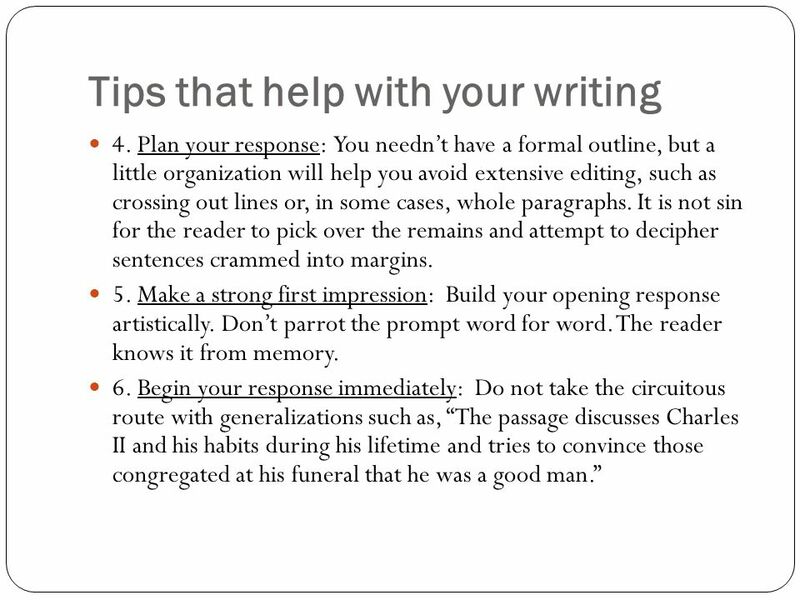 53 These tips should help with your writing. I. 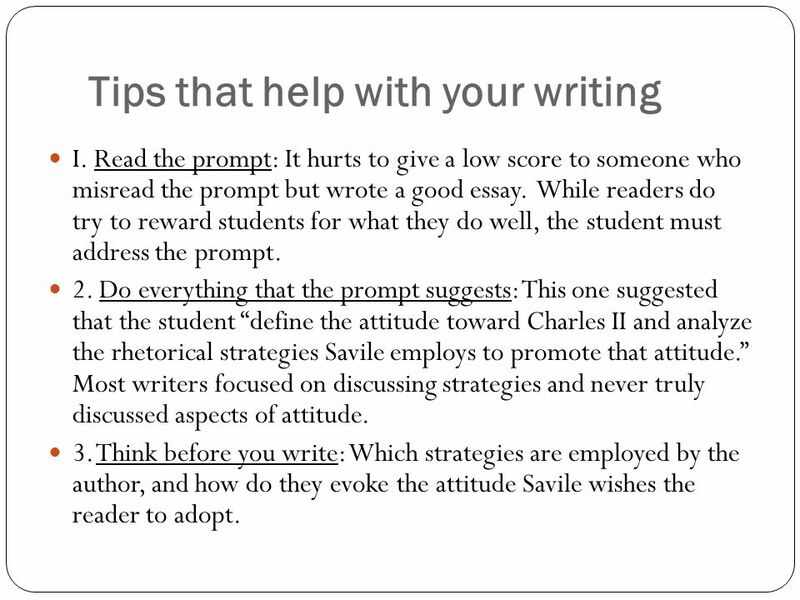 Read the prompt: It hurts to give a low score to someone who misread the prompt but wrote a good essay. While readers do try to reward students for what they do well, the student must address the prompt. 2. 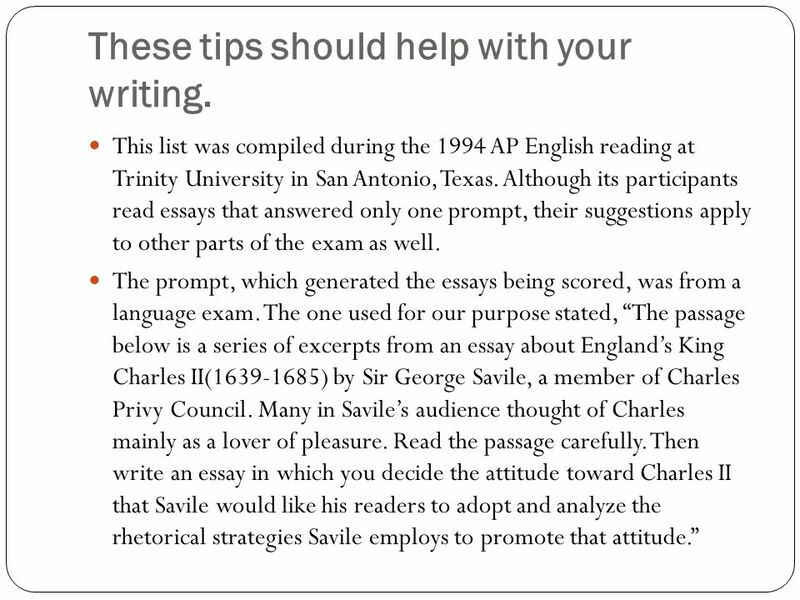 Do everything that the prompt suggests: This one suggested that the student “define the attitude toward Charles II and analyze the rhetorical strategies Savile employs to promote that attitude.” Most writers focused on discussing strategies and never truly discussed aspects of attitude. 3. Think before you write: Which strategies are employed by the author, and how do they evoke the attitude Savile wishes the reader to adopt. 7. Be thorough and specific: Do not simply “point out” strategies. Explain how they are used, give examples, and show how they establish attitude. ANALYZE! 8. Use clear transitions that help the reader to follow the flow of your essay: Keep your paragraphs organized; do not digress. 9. Resist putting in “canned” quotations or critics’ comments that may not fit: You will get a response from your reader, but it may not be the one you want. 10. Write to express, not to impress: Keep vocabulary and syntax within your zone of competence. Students who inflate their writing often inadvertently entertain but seldom explain. 11. Demonstrate that you understand style: Show the reader how the author has developed the selection to create the desired effect. This indicates that you understand the intricacies of the creative process. 12. Maintain the economy of language, saying much with few words: The best student writers say much but say it in the fewest possible words. 13. 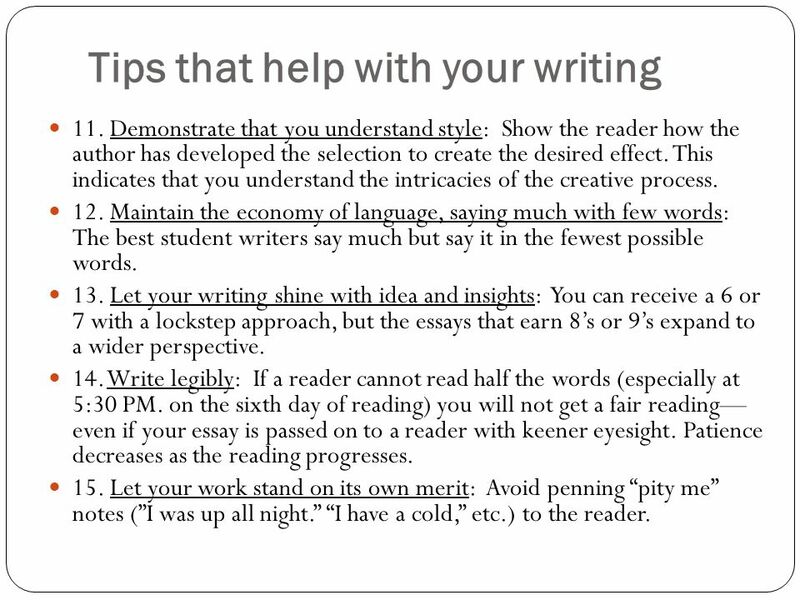 Let your writing shine with idea and insights: You can receive a 6 or 7 with a lockstep approach, but the essays that earn 8’s or 9’s expand to a wider perspective. 14. Write legibly: If a reader cannot read half the words (especially at 5:30 PM. on the sixth day of reading) you will not get a fair reading— even if your essay is passed on to a reader with keener eyesight. Patience decreases as the reading progresses. 15. Let your work stand on its own merit: Avoid penning “pity me” notes (”I was up all night.” “I have a cold,” etc.) to the reader. 58 Make a plan. 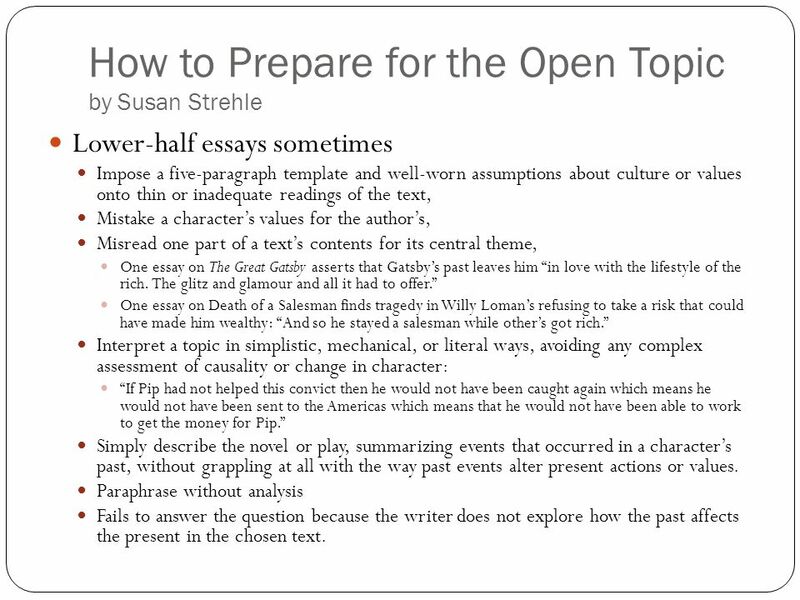 Students should not begin writing until they fully comprehend the prompt and/or the passage. Mere parroting of the prompt often leads to floundering around instead of developing a clear direction. Write directly on the passage and make quick notes and outlines in the margins. 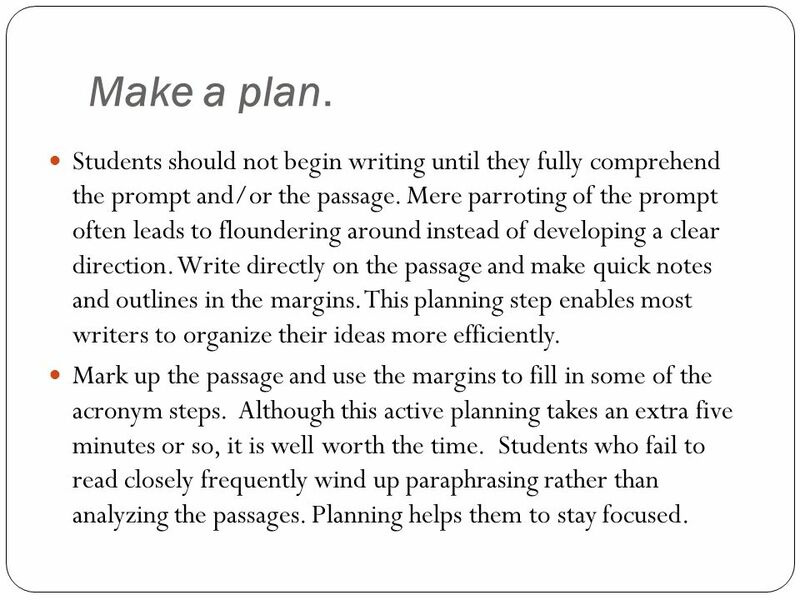 This planning step enables most writers to organize their ideas more efficiently. 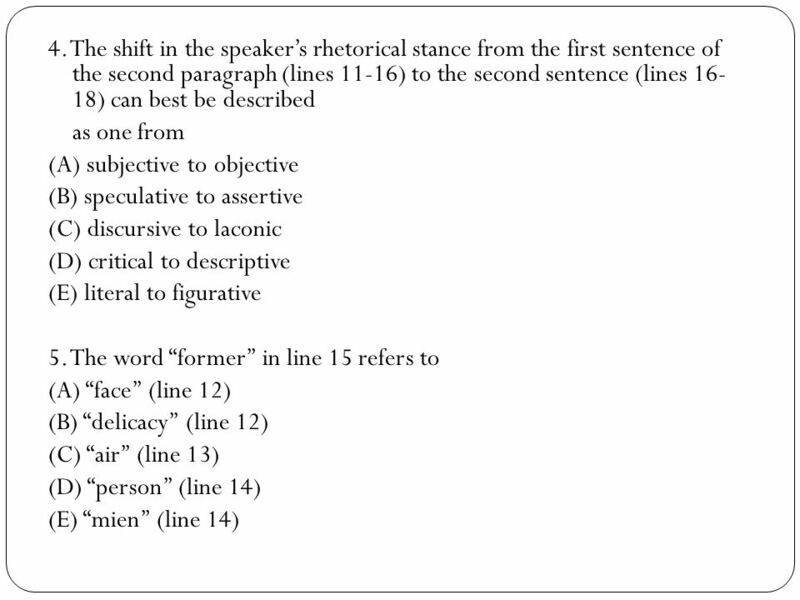 Mark up the passage and use the margins to fill in some of the acronym steps. Although this active planning takes an extra five minutes or so, it is well worth the time. Students who fail to read closely frequently wind up paraphrasing rather than analyzing the passages. Planning helps them to stay focused. 59 Begin quickly and directly. 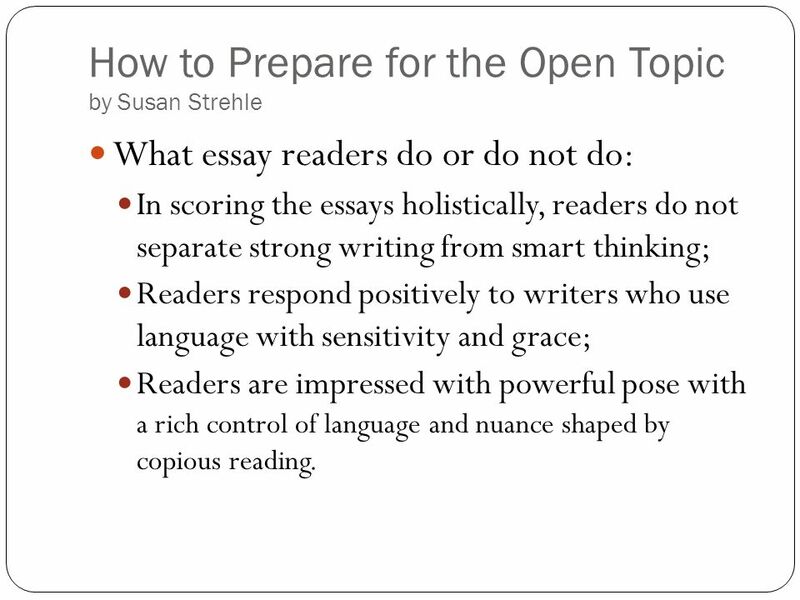 Although AP readers are instructed to read the entire essay and not to be prejudiced by a weak introduction, a strong opening paragraph can be a real asset to a student’s paper. 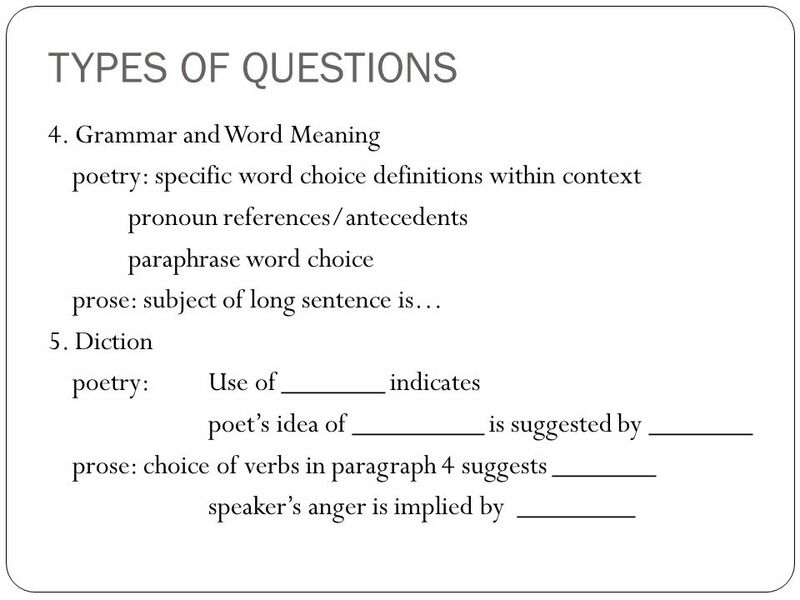 When answering the free-response part of the AP English Exams, writers should answer the question quickly and avoid beginning with ideas that do not relate directly to the prompt. Create an introduction strong enough to earn a grade of 3 all by itself. That means that students should learn ways to answer the entire prompt—answer the prompt, not simply repeat it--in the introduction. This indicates to the reader that the paper could be heading into the upper-half zone. 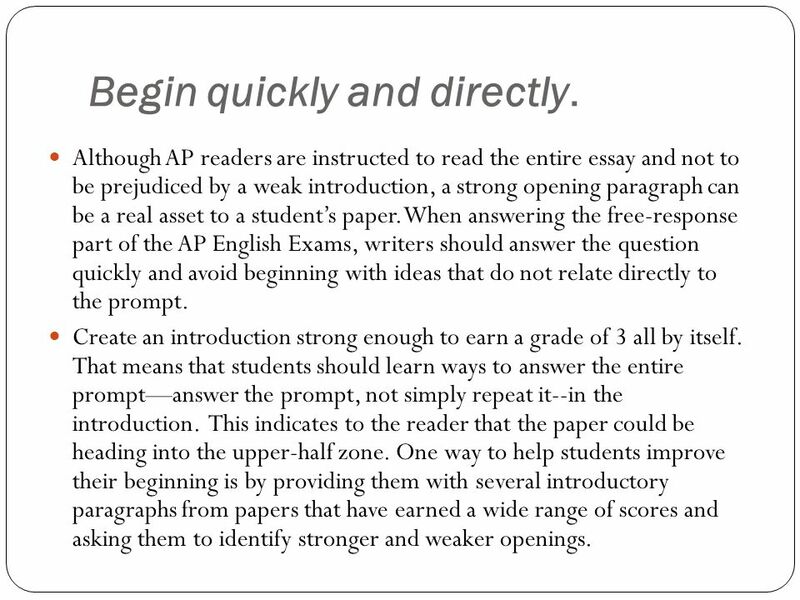 One way to help students improve their beginning is by providing them with several introductory paragraphs from papers that have earned a wide range of scores and asking them to identify stronger and weaker openings. 60 Use paragraphs and topic sentences. 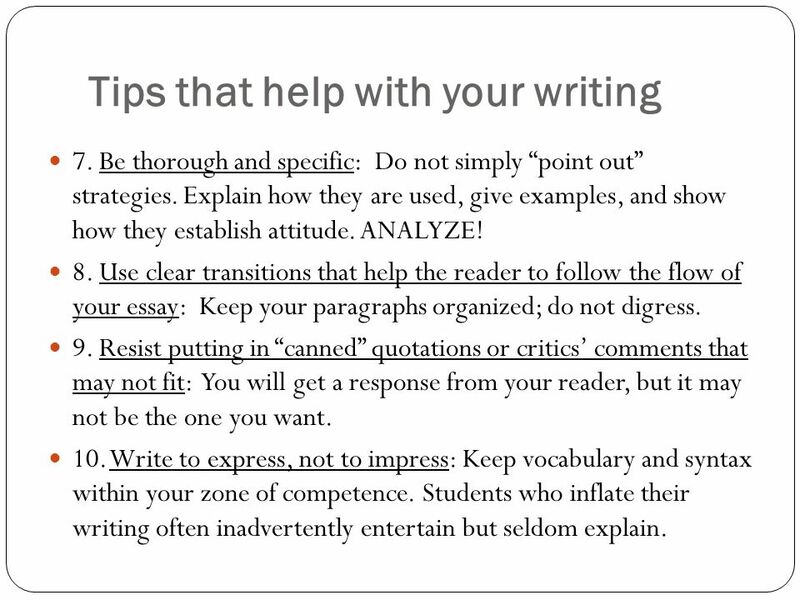 Although it may seem like a small matter, students should indent paragraphs clearly. A paper without indentation or with unclear indentation often confuses a reader. 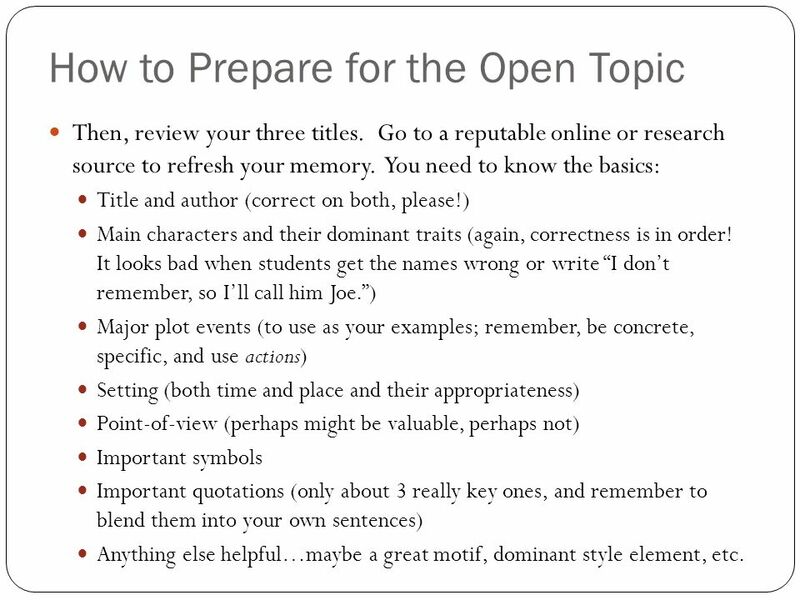 Paragraphs create the fundamental structure of the essay, and without them good ideas can get muddled. Most essays that do not use paragraphs tend to be full of confused and rambling thoughts. 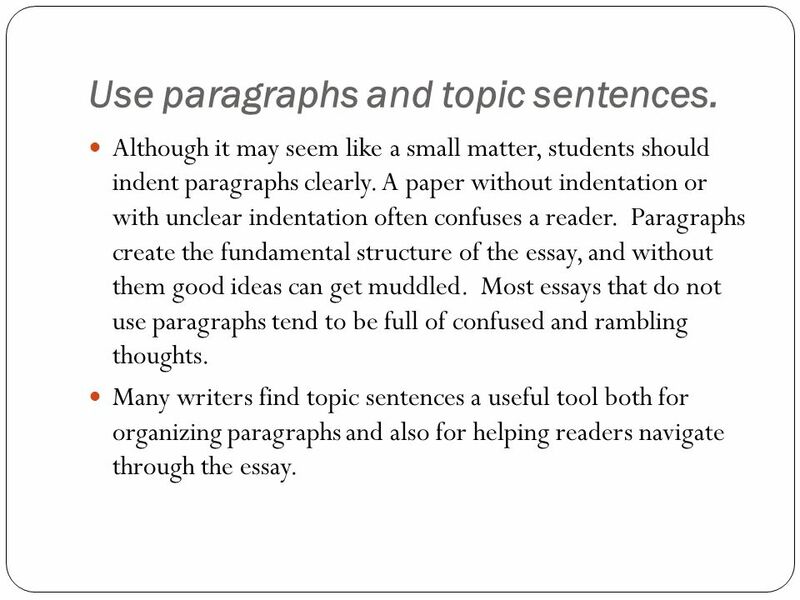 Many writers find topic sentences a useful tool both for organizing paragraphs and also for helping readers navigate through the essay. 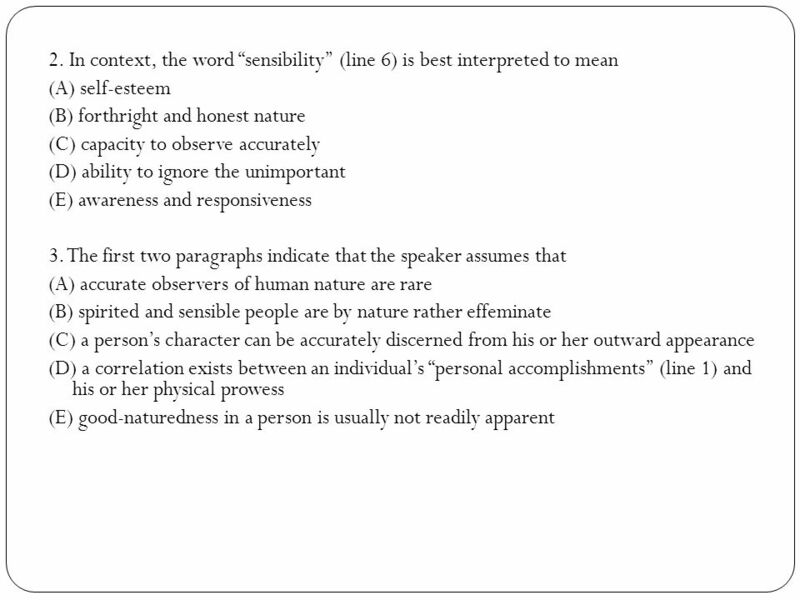 To score at least a 3, students would be wise to make use of pertinent references from the text. 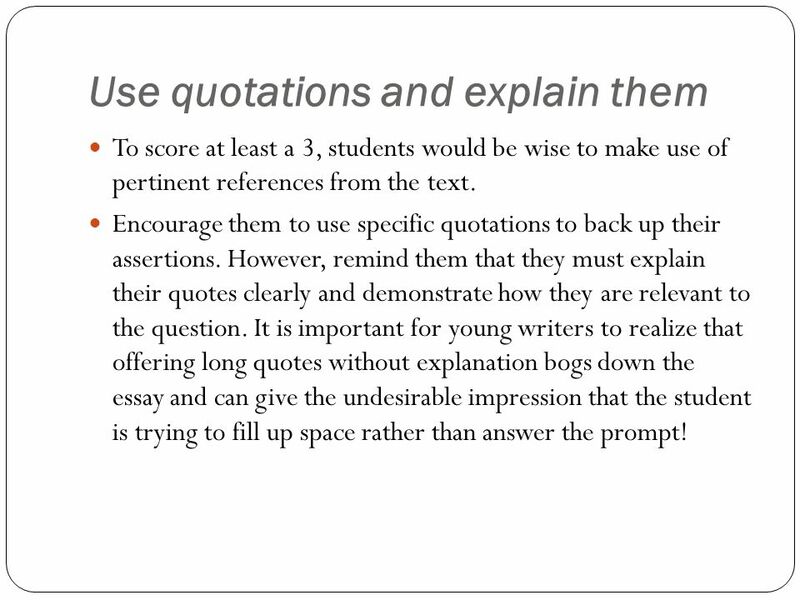 Encourage them to use specific quotations to back up their assertions. However, remind them that they must explain their quotes clearly and demonstrate how they are relevant to the question. It is important for young writers to realize that offering long quotes without explanation bogs down the essay and can give the undesirable impression that the student is trying to fill up space rather than answer the prompt! 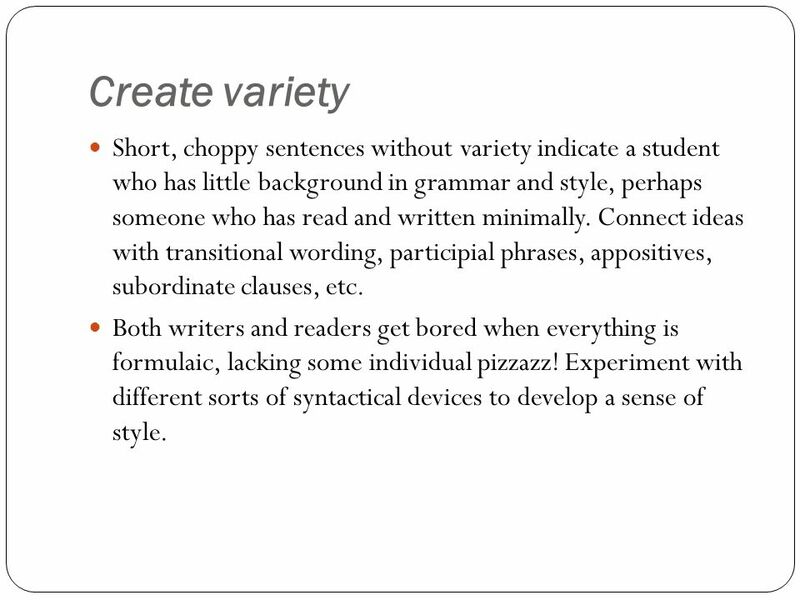 62 Create variety Short, choppy sentences without variety indicate a student who has little background in grammar and style, perhaps someone who has read and written minimally. Connect ideas with transitional wording, participial phrases, appositives, subordinate clauses, etc. Both writers and readers get bored when everything is formulaic, lacking some individual pizzazz! Experiment with different sorts of syntactical devices to develop a sense of style. 63 Find the right word An arsenal of appropriate vocabulary and analytical wording reveals a brilliant mind at work, but writers should make certain that the words fit. Some students stick in big words just to sound scholarly. Ironically, some of their papers score only a 2 because they lack clarity and sometimes say nothing of relevance to the prompt. Use the active voice as much as possible as one remedy for repetition and other superfluous wording. 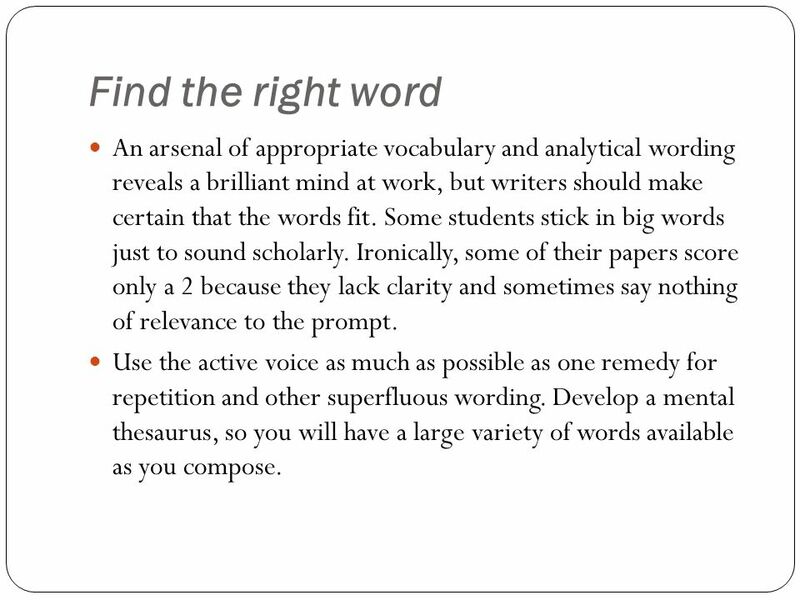 Develop a mental thesaurus, so you will have a large variety of words available as you compose. Make a list of the major works you studied in grades 9—12 (i.e. Great Expectations, Oedipus the King, The Grapes of Wrath, Heart of Darkness) Narrow the list to three titles that worked for you…novels (or full-length plays) that really meant a lot to you, “spoke” to you loudly…titles that you’ve got a lot to say about, namely good, deep universal truths. In general, avoid titles that you read in early years, especially middle school. 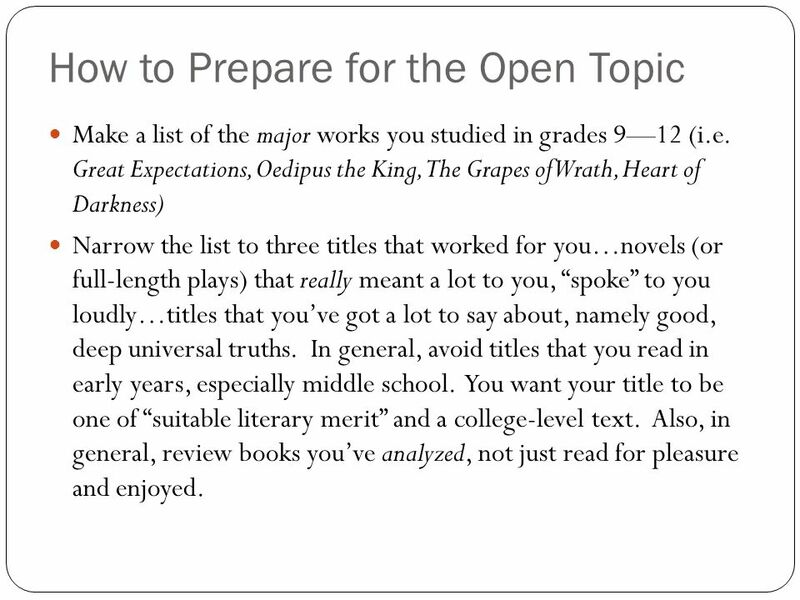 You want your title to be one of “suitable literary merit” and a college-level text. Also, in general, review books you’ve analyzed, not just read for pleasure and enjoyed. Then, review your three titles. Go to a reputable online or research source to refresh your memory. You need to know the basics: Title and author (correct on both, please!) Main characters and their dominant traits (again, correctness is in order! It looks bad when students get the names wrong or write “I don’t remember, so I’ll call him Joe.”) Major plot events (to use as your examples; remember, be concrete, specific, and use actions) Setting (both time and place and their appropriateness) Point-of-view (perhaps might be valuable, perhaps not) Important symbols Important quotations (only about 3 really key ones, and remember to blend them into your own sentences) Anything else helpful…maybe a great motif, dominant style element, etc. Make a study sheet of the above elements, but don’t go on and on…. One page per novel is plenty. Remember that articulating more than one universal truth (theme) per title is important. Great literature has many great ideas to share. 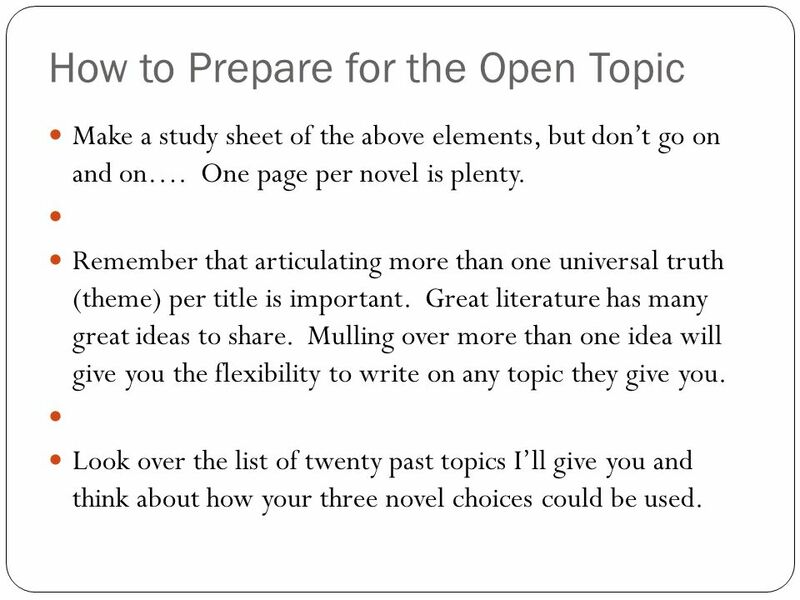 Mulling over more than one idea will give you the flexibility to write on any topic they give you. Look over the list of twenty past topics I’ll give you and think about how your three novel choices could be used. Finally, read broadly. 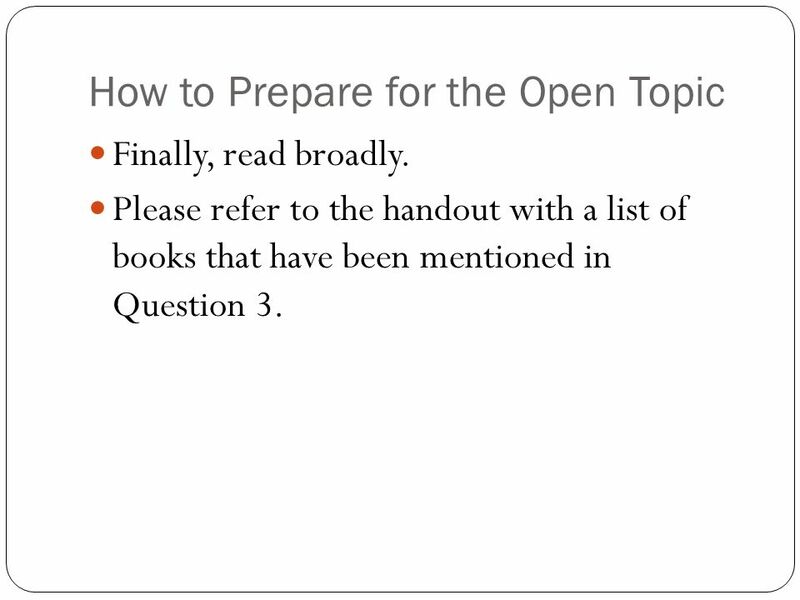 Please refer to the handout with a list of books that have been mentioned in Question 3. 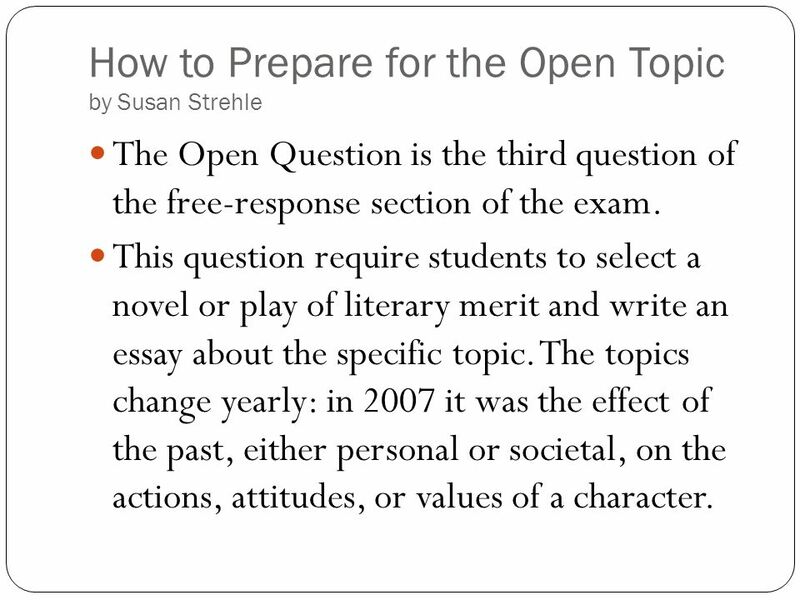 The Open Question is the third question of the free-response section of the exam. 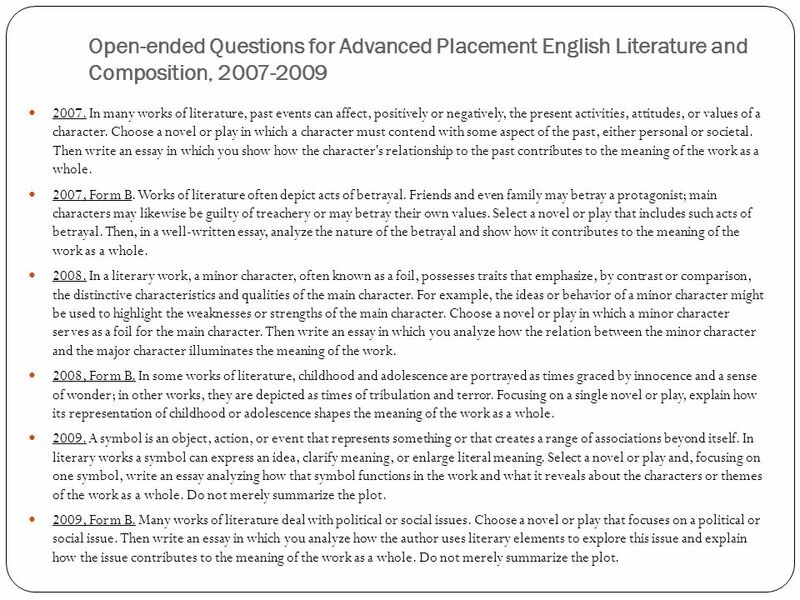 This question require students to select a novel or play of literary merit and write an essay about the specific topic. The topics change yearly: in 2007 it was the effect of the past, either personal or societal, on the actions, attitudes, or values of a character. 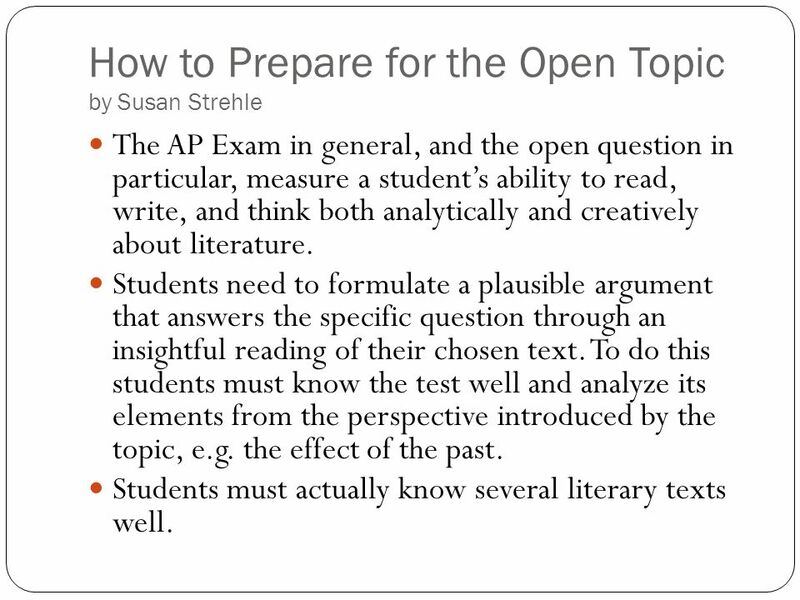 The AP Exam in general, and the open question in particular, measure a student’s ability to read, write, and think both analytically and creatively about literature. Students need to formulate a plausible argument that answers the specific question through an insightful reading of their chosen text. 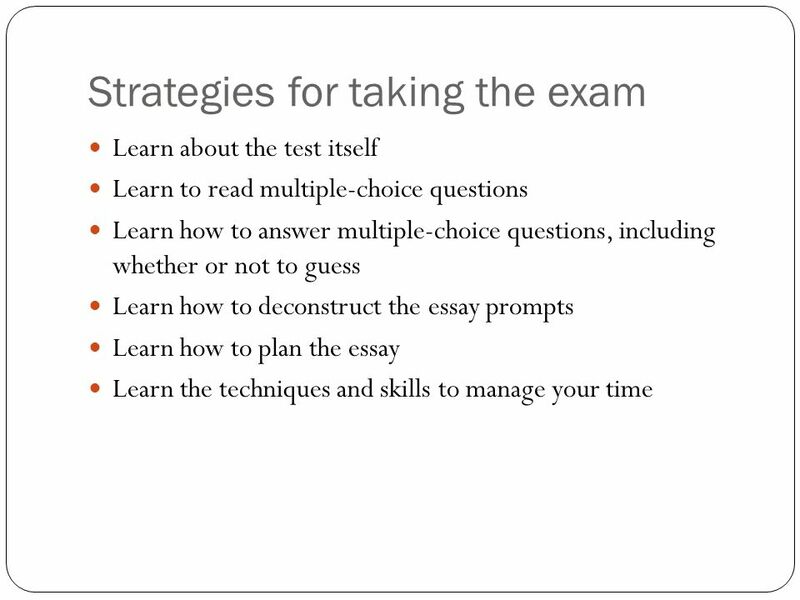 To do this students must know the test well and analyze its elements from the perspective introduced by the topic, e.g. the effect of the past. Students must actually know several literary texts well. 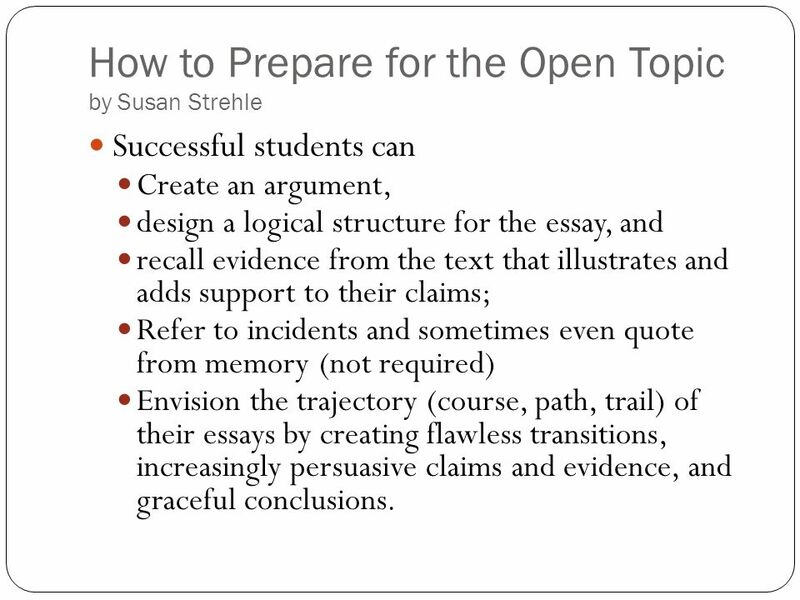 Successful students can Create an argument, design a logical structure for the essay, and recall evidence from the text that illustrates and adds support to their claims; Refer to incidents and sometimes even quote from memory (not required) Envision the trajectory (course, path, trail) of their essays by creating flawless transitions, increasingly persuasive claims and evidence, and graceful conclusions. 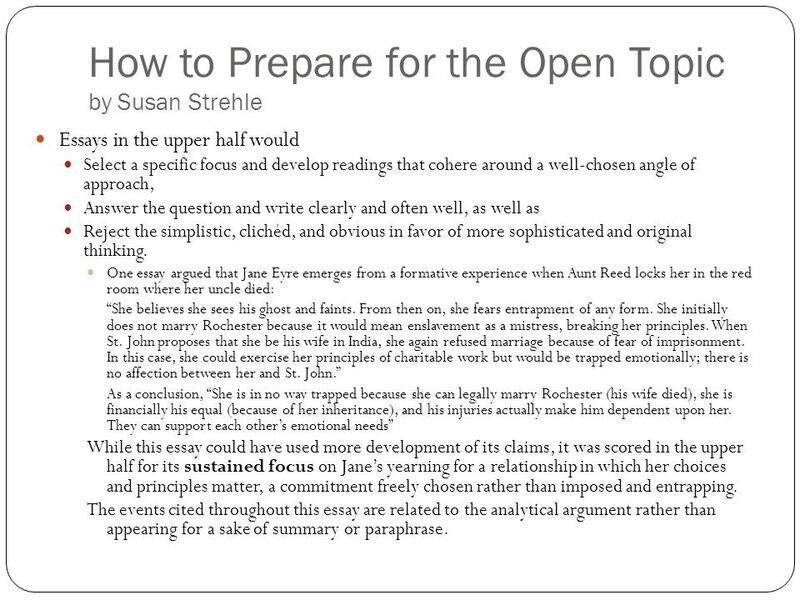 Essays in the upper half begin with an argument that answers the question in a specific and interesting way. 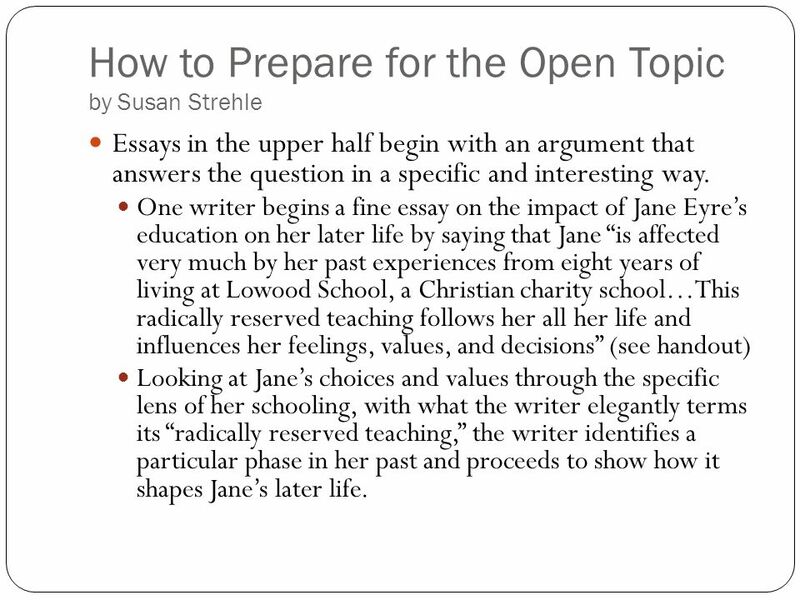 One writer begins a fine essay on the impact of Jane Eyre’s education on her later life by saying that Jane “is affected very much by her past experiences from eight years of living at Lowood School, a Christian charity school…This radically reserved teaching follows her all her life and influences her feelings, values, and decisions” (see handout) Looking at Jane’s choices and values through the specific lens of her schooling, with what the writer elegantly terms its “radically reserved teaching,” the writer identifies a particular phase in her past and proceeds to show how it shapes Jane’s later life. Essays in the upper half begin with an argument that answers the question in a specific and interesting way. Some successful students choose surprising and interesting characters for their focus, developing arguments about the effects of the past in the novel on a secondary character for whom the past bears different burdens. Such an essay remains focused on the effects of the past, from an angle that may lead to a different look at the novel. 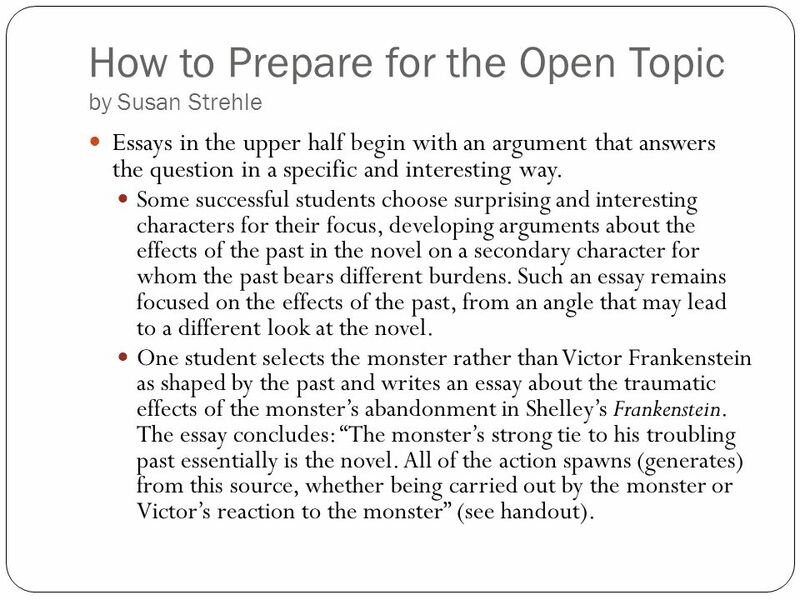 One student selects the monster rather than Victor Frankenstein as shaped by the past and writes an essay about the traumatic effects of the monster’s abandonment in Shelley’s Frankenstein. The essay concludes: “The monster’s strong tie to his troubling past essentially is the novel. All of the action spawns (generates) from this source, whether being carried out by the monster or Victor’s reaction to the monster” (see handout). 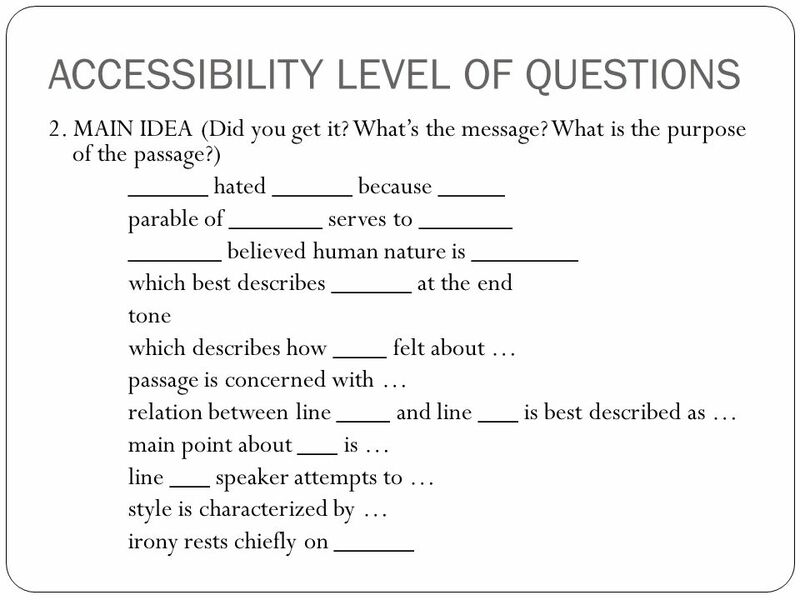 Essays in the upper half would Select a specific focus and develop readings that cohere around a well-chosen angle of approach, Answer the question and write clearly and often well, as well as Reject the simplistic, clichéd, and obvious in favor of more sophisticated and original thinking. One essay argued that Jane Eyre emerges from a formative experience when Aunt Reed locks her in the red room where her uncle died: “She believes she sees his ghost and faints. From then on, she fears entrapment of any form. She initially does not marry Rochester because it would mean enslavement as a mistress, breaking her principles. When St. John proposes that she be his wife in India, she again refused marriage because of fear of imprisonment. In this case, she could exercise her principles of charitable work but would be trapped emotionally; there is no affection between her and St. John.” As a conclusion, “She is in no way trapped because she can legally marry Rochester (his wife died), she is financially his equal (because of her inheritance), and his injuries actually make him dependent upon her. They can support each other’s emotional needs” While this essay could have used more development of its claims, it was scored in the upper half for its sustained focus on Jane’s yearning for a relationship in which her choices and principles matter, a commitment freely chosen rather than imposed and entrapping. The events cited throughout this essay are related to the analytical argument rather than appearing for a sake of summary or paraphrase. 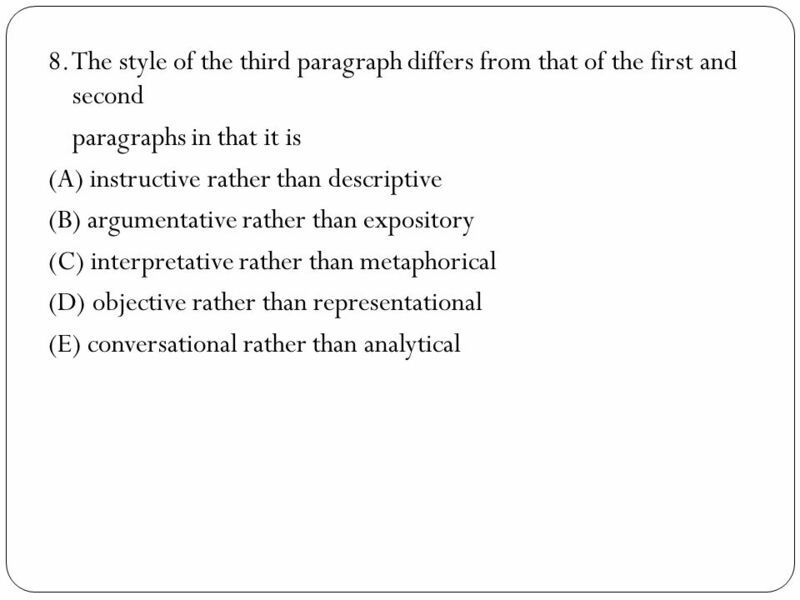 What essay readers do or do not do: In scoring the essays holistically, readers do not separate strong writing from smart thinking; Readers respond positively to writers who use language with sensitivity and grace; Readers are impressed with powerful pose with a rich control of language and nuance shaped by copious reading. Lower-half essays sometimes Impose a five-paragraph template and well-worn assumptions about culture or values onto thin or inadequate readings of the text, Mistake a character’s values for the author’s, Misread one part of a text’s contents for its central theme, One essay on The Great Gatsby asserts that Gatsby’s past leaves him “in love with the lifestyle of the rich. The glitz and glamour and all it had to offer.” One essay on Death of a Salesman finds tragedy in Willy Loman’s refusing to take a risk that could have made him wealthy: “And so he stayed a salesman while other’s got rich.” Interpret a topic in simplistic, mechanical, or literal ways, avoiding any complex assessment of causality or change in character: “If Pip had not helped this convict then he would not have been caught again which means he would not have been sent to the Americas which means that he would not have been able to work to get the money for Pip.” Simply describe the novel or play, summarizing events that occurred in a character’s past, without grappling at all with the way past events alter present actions or values. 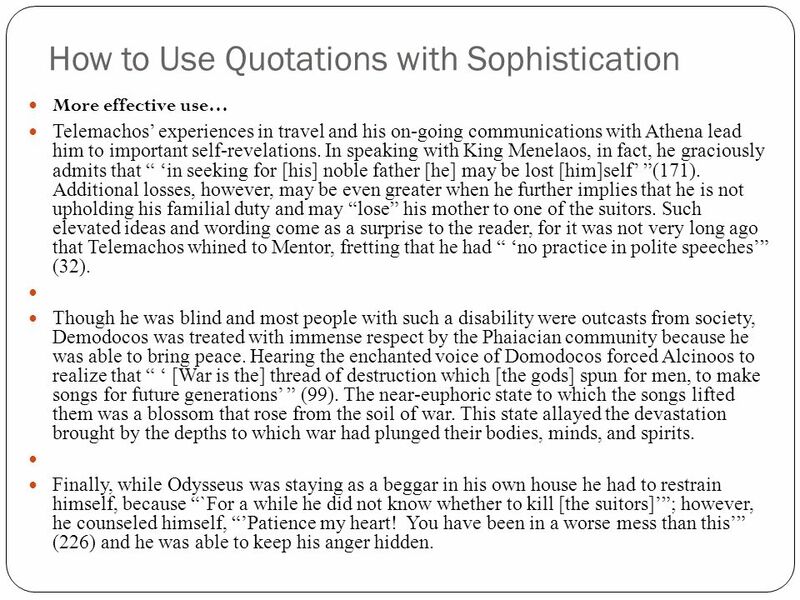 Paraphrase without analysis Fails to answer the question because the writer does not explore how the past affects the present in the chosen text. 2007. In many works of literature, past events can affect, positively or negatively, the present activities, attitudes, or values of a character. Choose a novel or play in which a character must contend with some aspect of the past, either personal or societal. Then write an essay in which you show how the character's relationship to the past contributes to the meaning of the work as a whole. 2007, Form B. Works of literature often depict acts of betrayal. Friends and even family may betray a protagonist; main characters may likewise be guilty of treachery or may betray their own values. Select a novel or play that includes such acts of betrayal. Then, in a well-written essay, analyze the nature of the betrayal and show how it contributes to the meaning of the work as a whole. 2008. In a literary work, a minor character, often known as a foil, possesses traits that emphasize, by contrast or comparison, the distinctive characteristics and qualities of the main character. For example, the ideas or behavior of a minor character might be used to highlight the weaknesses or strengths of the main character. Choose a novel or play in which a minor character serves as a foil for the main character. Then write an essay in which you analyze how the relation between the minor character and the major character illuminates the meaning of the work. 2008, Form B. In some works of literature, childhood and adolescence are portrayed as times graced by innocence and a sense of wonder; in other works, they are depicted as times of tribulation and terror. Focusing on a single novel or play, explain how its representation of childhood or adolescence shapes the meaning of the work as a whole. 2009. A symbol is an object, action, or event that represents something or that creates a range of associations beyond itself. In literary works a symbol can express an idea, clarify meaning, or enlarge literal meaning. 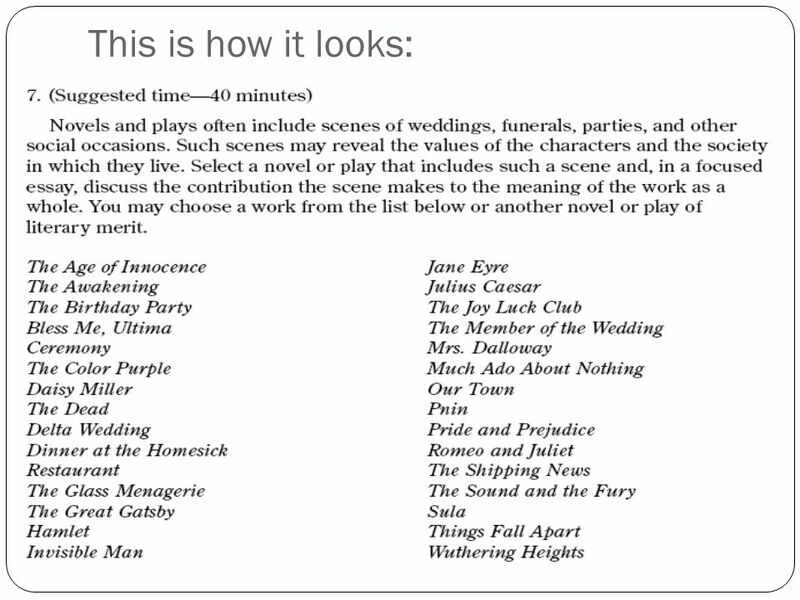 Select a novel or play and, focusing on one symbol, write an essay analyzing how that symbol functions in the work and what it reveals about the characters or themes of the work as a whole. Do not merely summarize the plot. 2009, Form B. Many works of literature deal with political or social issues. Choose a novel or play that focuses on a political or social issue. Then write an essay in which you analyze how the author uses literary elements to explore this issue and explain how the issue contributes to the meaning of the work as a whole. Do not merely summarize the plot. 2004. Critic Roland Barthes has said, "Literature is the question minus the answer." Choose a novel, or play, and, considering Barthes' observation, write an essay in which you analyze a central question the work raises and the extent to which it offers answers. 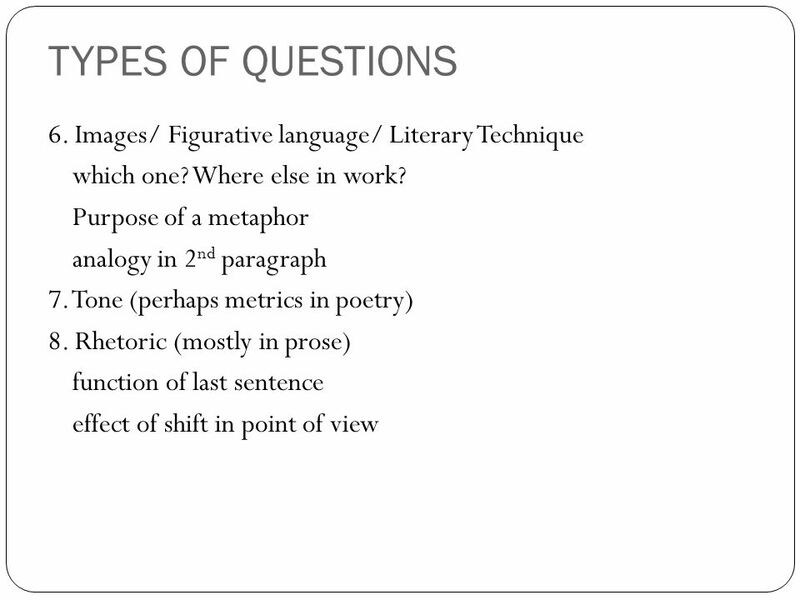 Explain how the author's treatment of this question affects your understanding of the work as a whole. Avoid mere plot summary. 2004, Form B. The most important themes in literature are sometimes developed in scenes in which a death or deaths take place. Choose a novel or play and write a well-organized essay in which you show how a specific death scene helps to illuminate the meaning of the work as a whole. Avoid mere plot summary. 2005. In Kate Chopin's The Awakening (1899), protagonist Edna Pontellier is said to possess "That outward existence which conforms, the inward life that questions." In a novel or play that you have studied, identify a character who outwardly conforms while questioning inwardly. Then write an essay in which you analyze how this tension between outward conformity and inward questioning contributes to the meaning of the work. Avoid mere plot summary. 2005, Form B. One of the strongest human drives seems to be a desire for power. Write an essay in which you discuss how a character in a novel or a drama struggles to free himself or herself from the power of others or seeks to gain power over others. Be sure to demonstrate in your essay how the author uses this power struggle to enhance the meaning of the work. Many writers use a country setting to establish values within a work of literature. For example, the country may be a place of virtue and peace or one of primitivism and ignorance. Choose a novel or play in which such a setting plays a significant role. Then write an essay in which you analyze how the country setting functions in the work as a whole. 2006, Form B. In many works of literature, a physical journey – the literal movement from one place to another – plays a central role. Choose a novel, play, or epic poem in which a physical journey is an important element and discuss how the journey adds to the meaning of the work as a whole. Avoid mere plot summary. 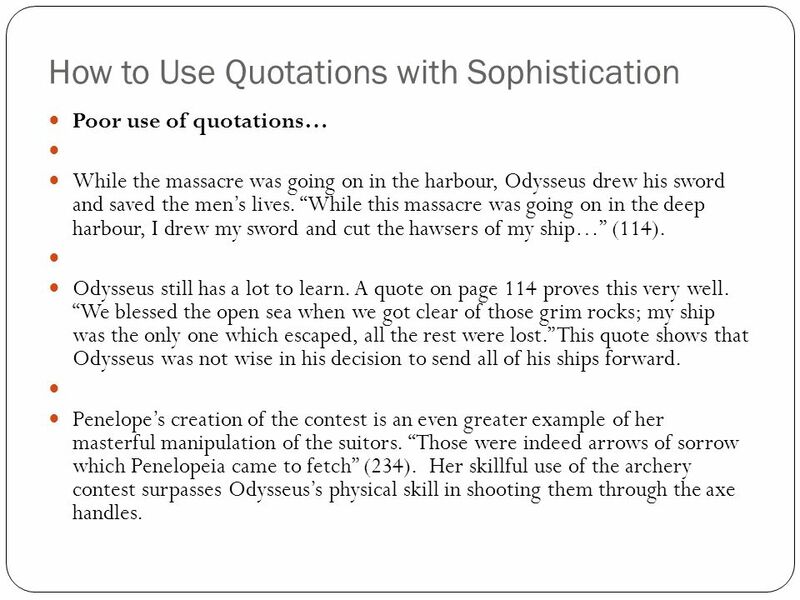 Poor use of quotations… While the massacre was going on in the harbour, Odysseus drew his sword and saved the men’s lives. “While this massacre was going on in the deep harbour, I drew my sword and cut the hawsers of my ship…” (114). Odysseus still has a lot to learn. A quote on page 114 proves this very well. “We blessed the open sea when we got clear of those grim rocks; my ship was the only one which escaped, all the rest were lost.” This quote shows that Odysseus was not wise in his decision to send all of his ships forward. Penelope’s creation of the contest is an even greater example of her masterful manipulation of the suitors. “Those were indeed arrows of sorrow which Penelopeia came to fetch” (234). Her skillful use of the archery contest surpasses Odysseus’s physical skill in shooting them through the axe handles. More effective use… Telemachos’ experiences in travel and his on-going communications with Athena lead him to important self-revelations. In speaking with King Menelaos, in fact, he graciously admits that “ ‘in seeking for [his] noble father [he] may be lost [him]self’ ”(171). Additional losses, however, may be even greater when he further implies that he is not upholding his familial duty and may “lose” his mother to one of the suitors. Such elevated ideas and wording come as a surprise to the reader, for it was not very long ago that Telemachos whined to Mentor, fretting that he had “ ‘no practice in polite speeches’” (32). Though he was blind and most people with such a disability were outcasts from society, Demodocos was treated with immense respect by the Phaiacian community because he was able to bring peace. Hearing the enchanted voice of Domodocos forced Alcinoos to realize that “ ‘ [War is the] thread of destruction which [the gods] spun for men, to make songs for future generations’ ” (99). The near-euphoric state to which the songs lifted them was a blossom that rose from the soil of war. This state allayed the devastation brought by the depths to which war had plunged their bodies, minds, and spirits. Finally, while Odysseus was staying as a beggar in his own house he had to restrain himself, because “`For a while he did not know whether to kill [the suitors]’”; however, he counseled himself, “’Patience my heart! You have been in a worse mess than this’” (226) and he was able to keep his anger hidden. 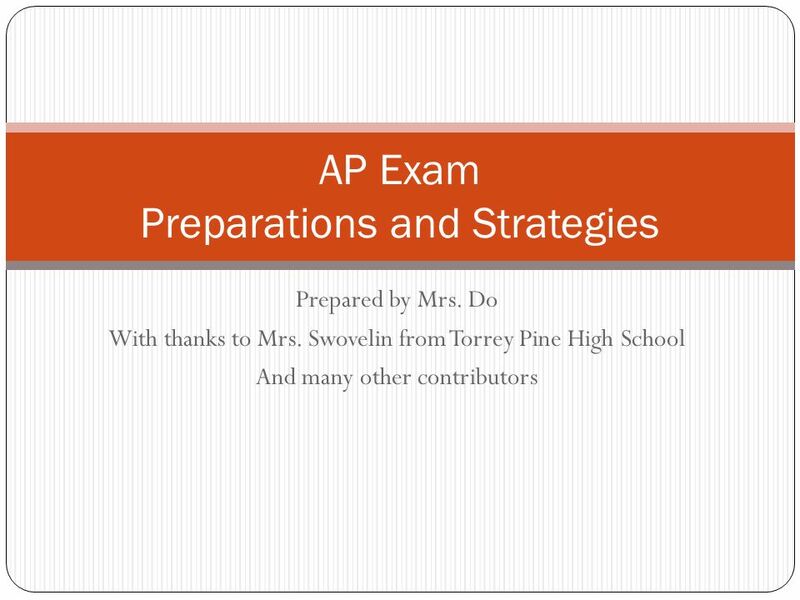 Download ppt "AP Exam Preparations and Strategies"
In many works of literature, a main character has a mentor or mentor-like acquaintance whose influence dramatically changes how the character views not. Hints for Passing the Exam! To advance to the next section, Mouse click on ! wherever it appears. 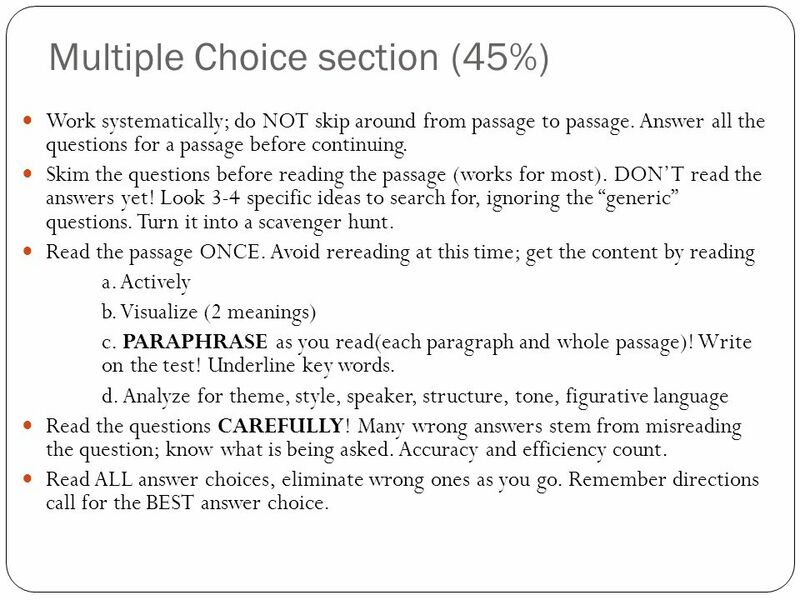 How to Succeed at Life (and Do Well on the AP English Language and Composition Multiple Choice) Adapted from: English Language and Composition, 3rd Edition. E. Barton 1.  There is no substitute for independent preparation. It is quite clear who is revising and who is not.  You need to revise all materials. English A Language and Literature Preparing for Paper Two What must you be able to do? Writing a literary analysis essay English II Honors. 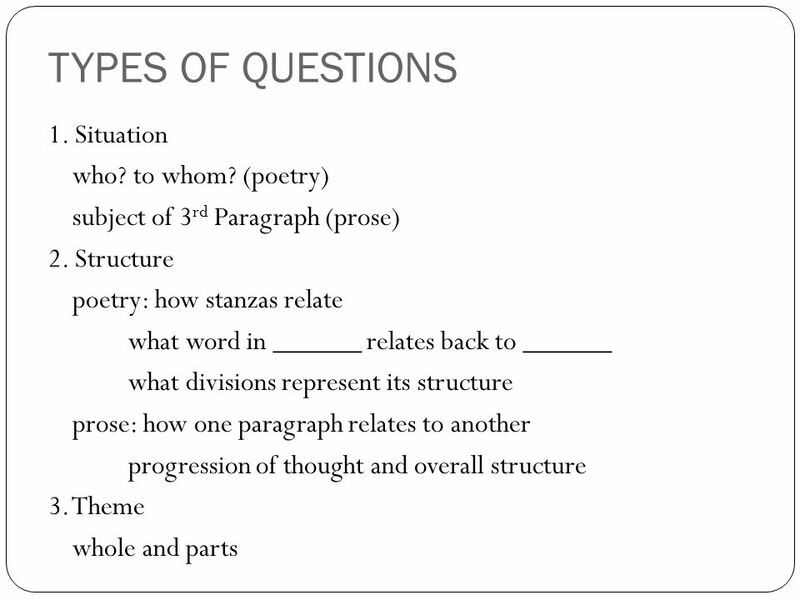 Essay Writing Elements of the Essay. 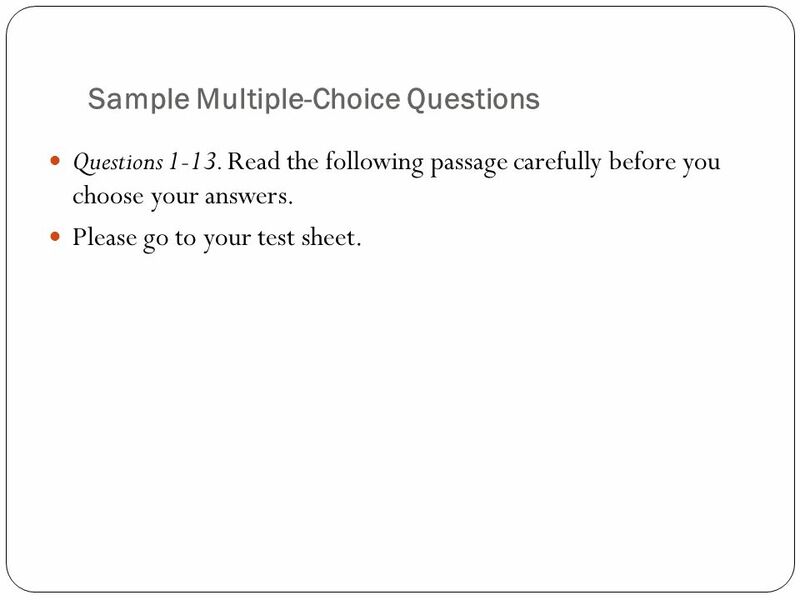 Test Taking Tips How to help yourself with multiple choice and short answer questions for reading selections A. Caldwell.  A summary is a brief restatement of the essential thought of a longer composition. 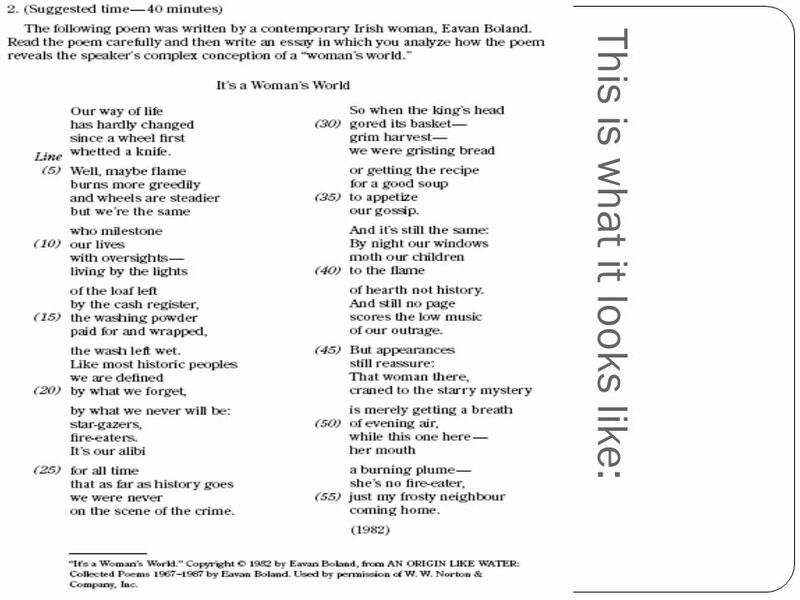 It reproduces the theme of the original with as few words as possible. 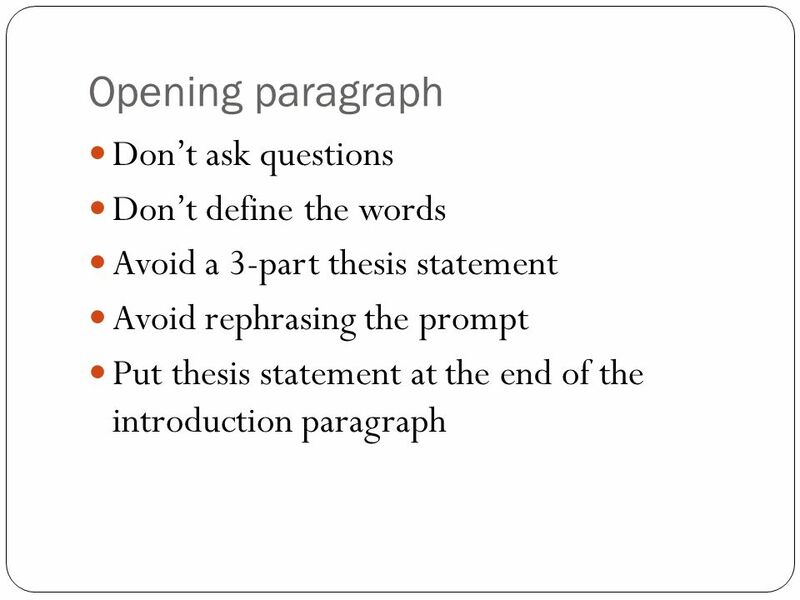 Constructing Your Essay Like any type of essay, an analytical essay consists of an introductory paragraph ending with a thesis statement, supporting body.